1. How do you rate this entire LEGO Disney 2 Series? 2. How do you find this review? Do you find it helpful and useful? 3. 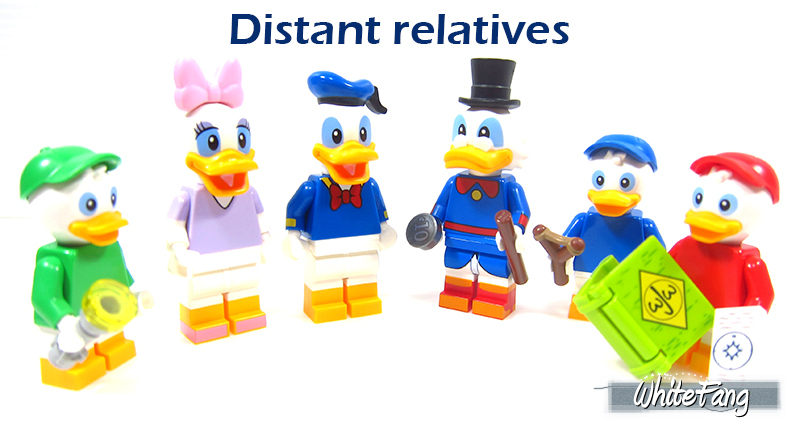 Do you like the distribution allocation number based on the designs for LEGO Disney Series 2? 4. 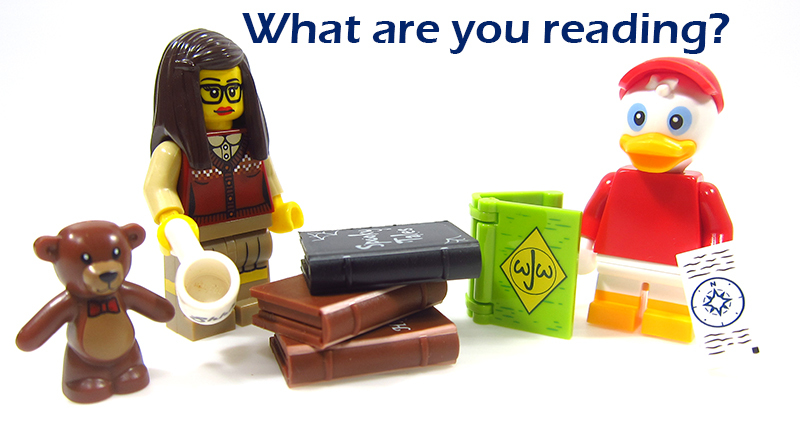 Will you like to see traditional LEGO Collectable Minifigures Series? I am very pleased to share my latest reviewing adventure on the brand new LEGO Minifigures - The LEGO Disney 2 Series and it will be available worldwide in May 2019. 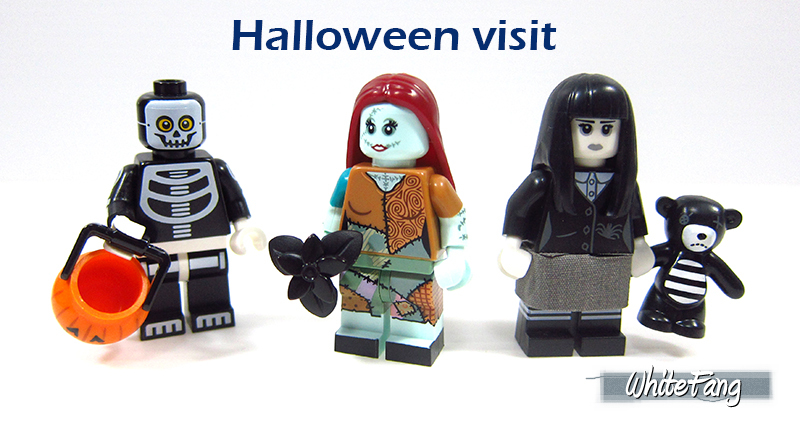 Special thanks to The LEGO Group (TLG) which comprise of the LEGO CEE and LEGO Collectable Minifigures Design Team for making this reviewing opportunity possible. We also should not forget our EB Ambassador, Jim. My sincere thanks to my wife (Belun) for her dedicated support. 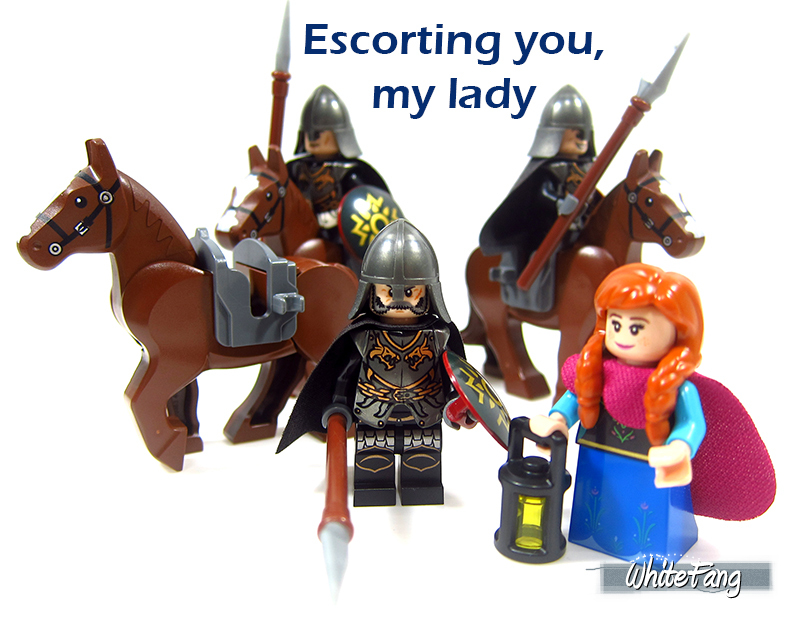 It's been nine whole years and it amazed me that I had actually completed 29 exhaustive LEGO pictorial reviews including this current one, solely for the coverage of the LEGO Collectable Minifigures Series / LEGO Minifigures Theme. Following Eurobricks tradition for the past Collectable Minifigures polls, we started with a humble beginning of Series 1 followed by Series 2 in the year 2010 and it continued to spread like wildfire with another three strong waves of minifigures craze in the year 2011, putting Series 3, Series 4 and Series 5 in an excellent harvesting year. In the year 2012, we celebrated with Series 6, Series 7 and recent Series 8. With the year 2013, we had the Series 9, Series 10 and Series 11. In the year 2014, we seen the LEGO Movie Series, The first LEGO Simpsons Series and Series 12. In the year 2015, we had the Series 13, LEGO Simpsons Series 2 and Series 14. In the year 2016, we seen the Series 15, LEGO Disney Series 1 and Series 16. In the year 2017, we have the LEGO Batman Movie Series, Series 17 and LEGO Ninjago Movie Series. In the year 2018, we experienced the LEGO Batman Movie Series 2, Series 18 and LEGO Harry Potter and Fantastic Beasts Series 1. In the year 2019, we seen the LEGO Movie 2 series. Now, let's see where your vote will bring us for the LEGO Disney 2 series poll statistics. 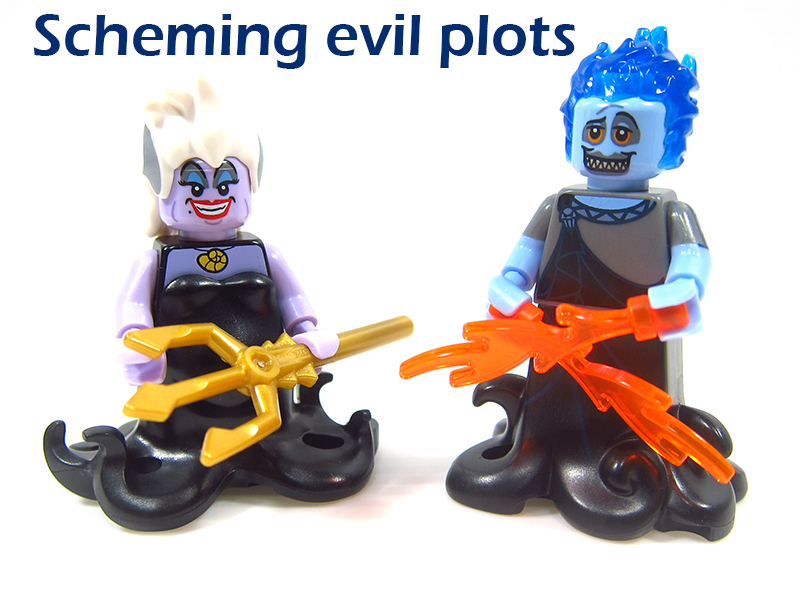 The LEGO Minifigures - The LEGO Disney Series 2 followed closely with the previous LEGO Disney Series by utilising the medium blue colour schema. What could possibly lurk within these mysterious sealed packets? 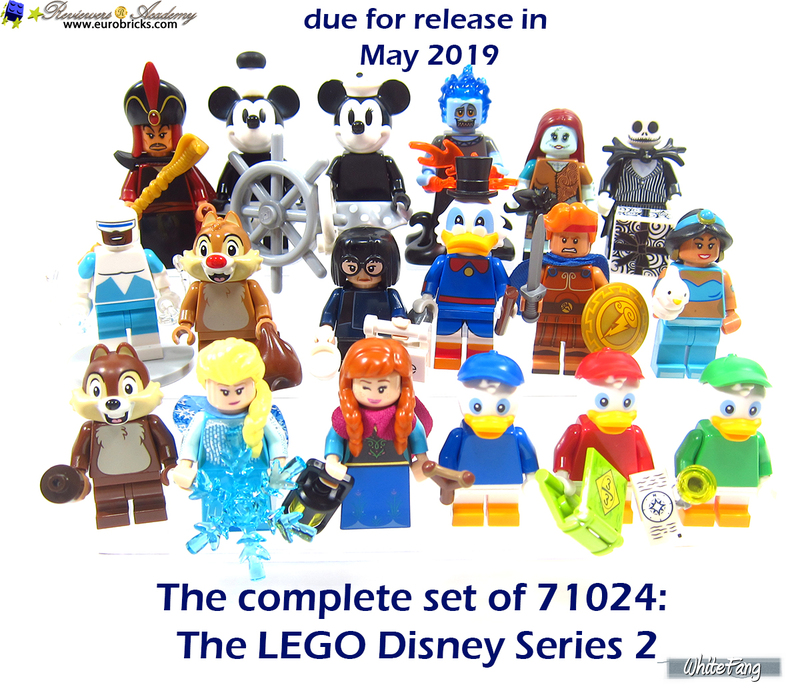 With the recent news release for the LEGO Disney Series 2, the global LEGO communities were very hyped and looking forward to this brand new LEGO Minifigures - LEGO Disney Series 2. This new sequel continued from the LEGO Minifigures - LEGO Disney Series 1 which was first released in 2016. After three years of hiatus, TLG presented with us the second Disney Series which will expand greatly into Disney realm. 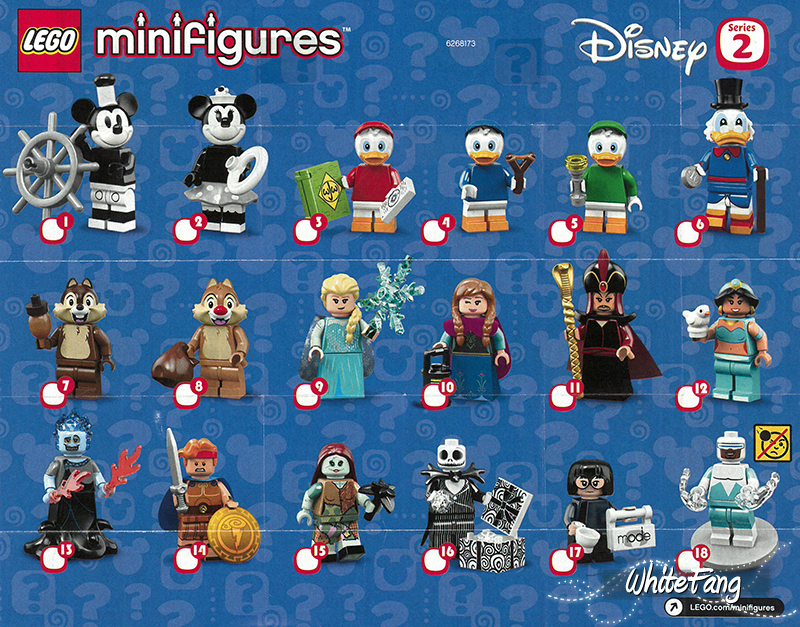 The Disney Series 2 built upon the same number of 18 minifigures from the previous series and it expanded from current and newly released Disney themes. The Disney Series 2 contained eight major themes for the 18 unique characters which are made up of Vintage Disney, Ducktales, Chip 'N' Dale, Frozen, Aladdin, Hercules, The Nightmare Before Christmas and The Incredibles. We are also pleased to see the expanded Disney characters expanded into previously released themes like the Aladdin and The Incredibles. Both are amazing Disney themes which will interest many fans. There are much exciting things to discover about when I first opened these packets. A few notable things to be very elated about include is the large numbers of unique molds and hairpieces. There are a decent amount of new accessories for the minifigures. Furthermore, almost all the minifgures had back printing and side printing that include arms with two toned printing. These remarkable designs and new additions are very impressive which I will like to draw to your attention in the individual minifigures' showcase. IMPORTANT: Please note that the naming for all 18 minifigures, where applicable, that I have use for this review are likely to be official TLG minifigures naming for the LEGO Minifigures - LEGO Disney 2 Series. In addition, this box is not sealed and the distribution ratio which I have received is based on my received copy. This distribution ratio is not intend to serve as a 100% accurate distribution. I reckon it has a good 98% confidence level. Based on the above distribution, I have managed to achieve two full complete sets of 18 one-of-a kind minifigures each. 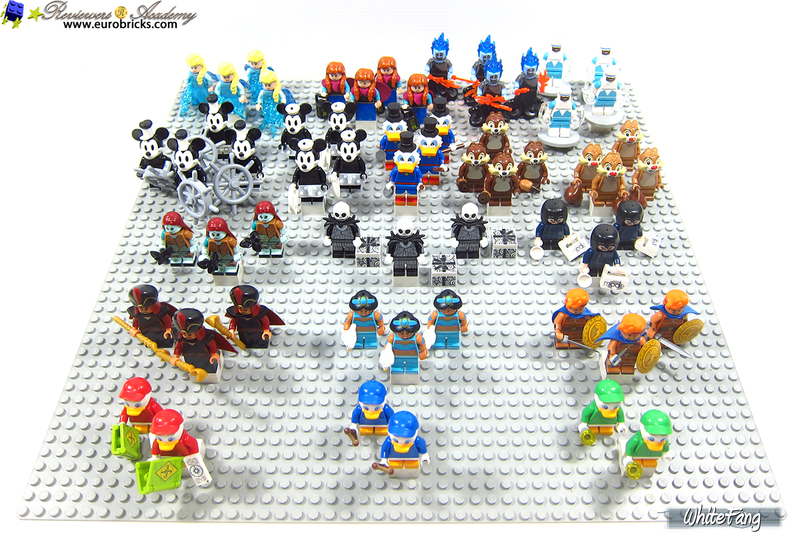 This arrangement will make many LEGO fans pretty frustrated frustrated as there are 24 spare minifigures which can be ideally converted into another complete set. This lessen the incentive by simply buying a mint box or finding your desired minifigures in the wild. 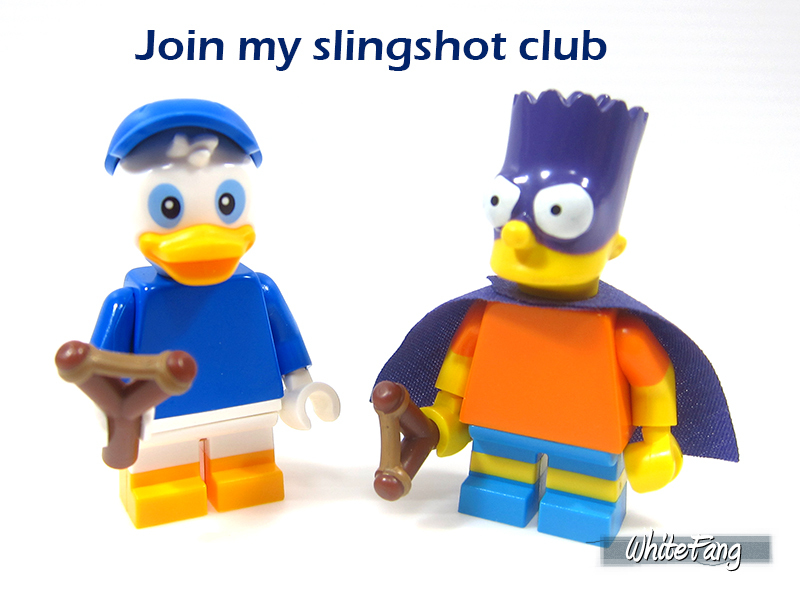 I wonder which are the minifigures will be the most popular and hard-to-find for you guys. I would think the three nephews of Scrooge McDuck will be very hard to locate due to its very limited number of appearance. As for the others, I am guessing Hercules might be a little hard to find. The Frozen characters and Chip 'N' Dale is also another high possibility. That's just my speculated guess. 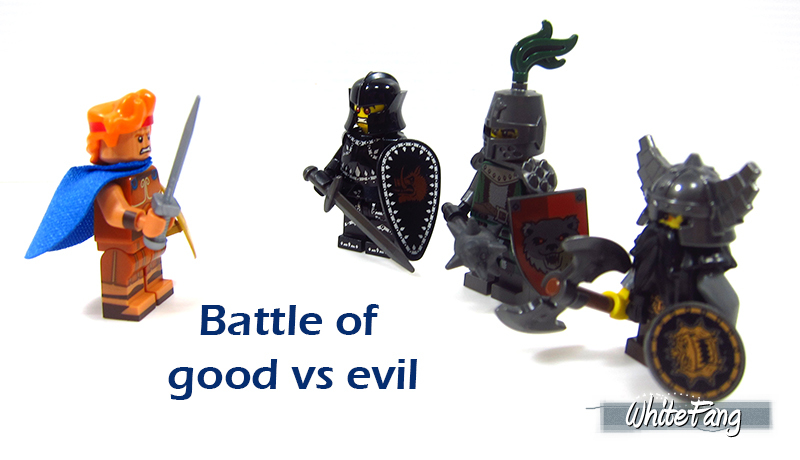 The LEGO Minifigures Theme is a force not to be reckoned with and remain a very strong contender in the TLG product range since 2010. 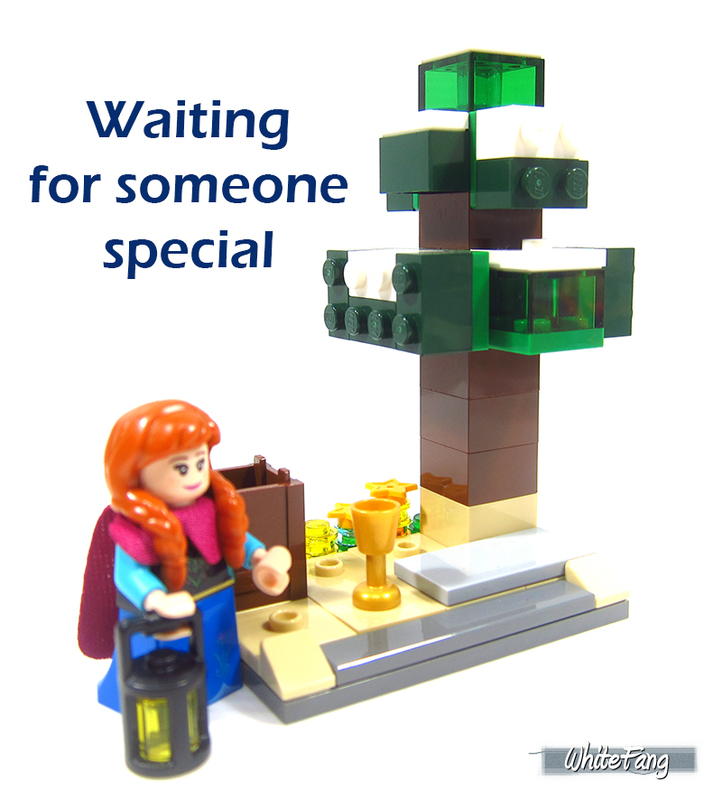 30 different releases including regional exclusives are not easy to replicate the craze in many LEGO CMFs followers. So, are you still following the CMFs craze since Day 1? Take a closer look at the following images. 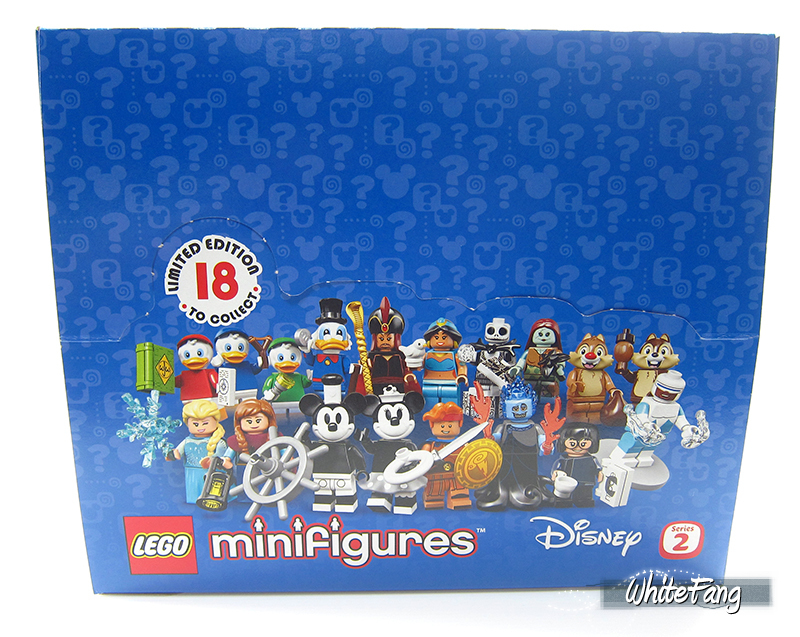 This is the front view of The LEGO Disney Series 2 packet, while this shows the back view of it. The new LEGO Minifigures packets are likely to continue in this packaging fashion since the era of Unikitty Series and their back view where some of the content are packed in individual sealed packet. When you open the packet, you will see this amount of content pouring out and the instruction manual is folded and sealed with a tape. 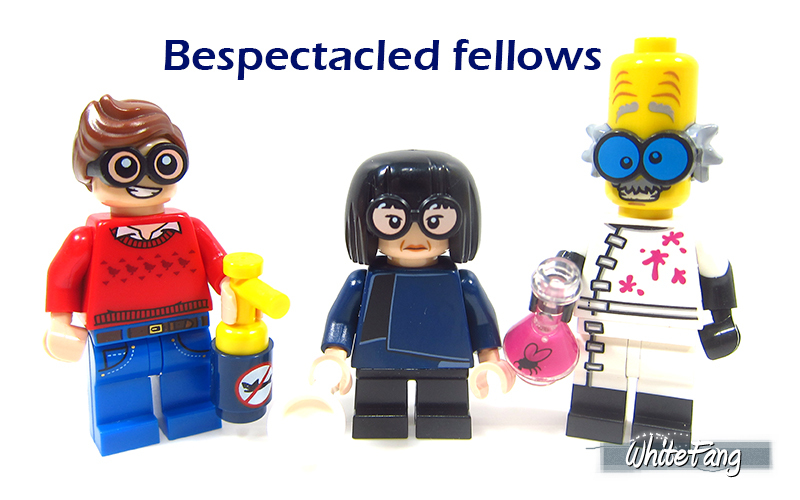 Among the 18 minifigures, these are the five minifigures with a separate sealed packet within the building packet. 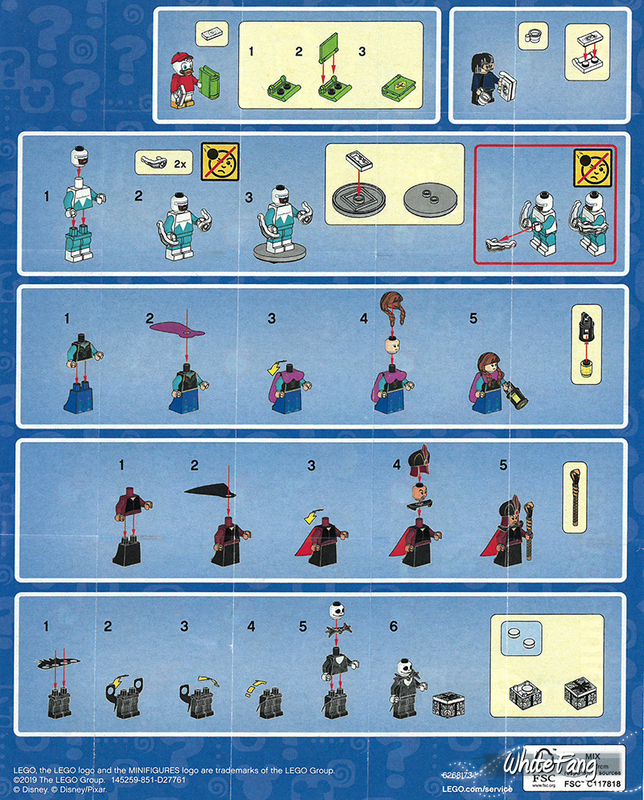 In fact, there are some elements which are kept separately and in this case, it is the minifigures' capes. I guess the reason why the minifigure packet is much bigger is due to accommodate these sealed packets respectively. Simple reminder to my regular CMFs readers. If you are intending to collect the precious and hard-to-find minifigures, hone your skills for the touch and feel method. This is an important skill set in order to locate the minifigures that you want without spending too much money by randomly acquire them, especially so when you are intending to buy large quantities. 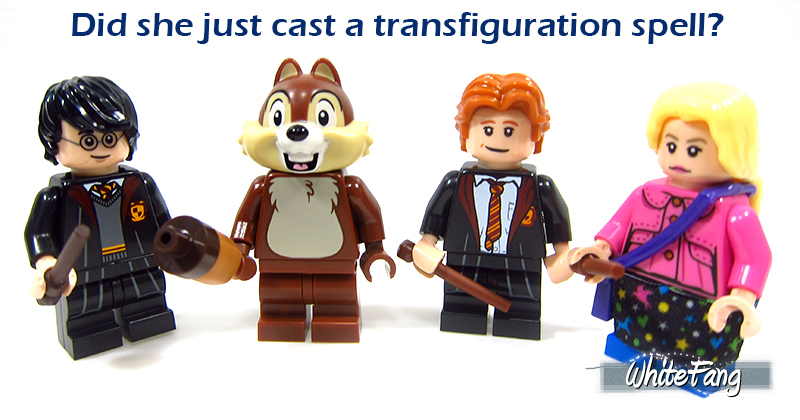 Your sole mission is to memorise and remember the minifigures assortments for each of the specialised designs. 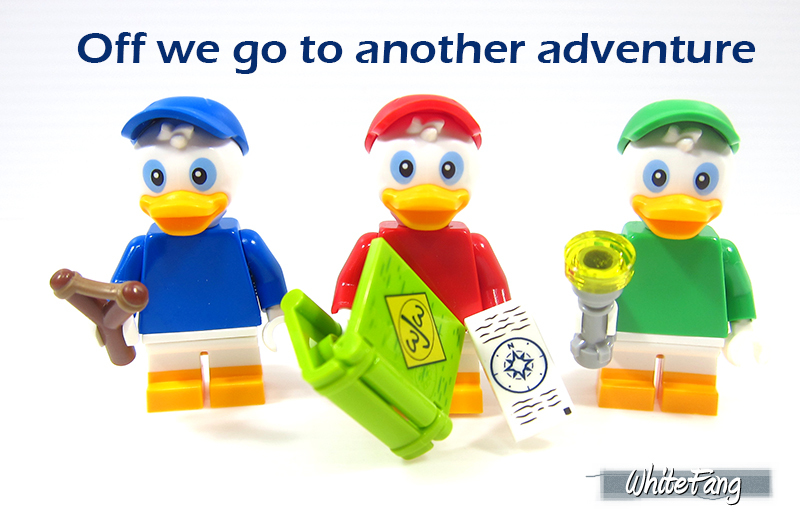 Isolate and identify the most unique accessory or accessories for the particular minifigure. From there, eliminate the torso, head and legs and feel for the other parts. 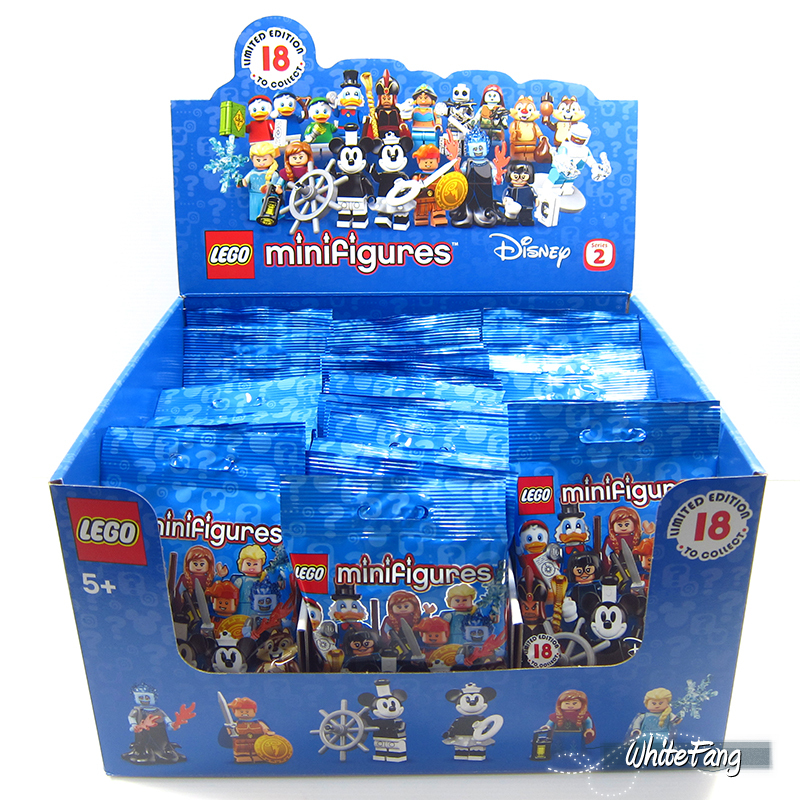 The sole disadvantage of this method is that much time would be wasted if the minifigures that you are looking for have been taken from the box. You might also end up with sore numb thumbs after feeling them. Please be careful and treat the packets with respect when you do the above. Reason being, there are many fragile and soft parts in this series. 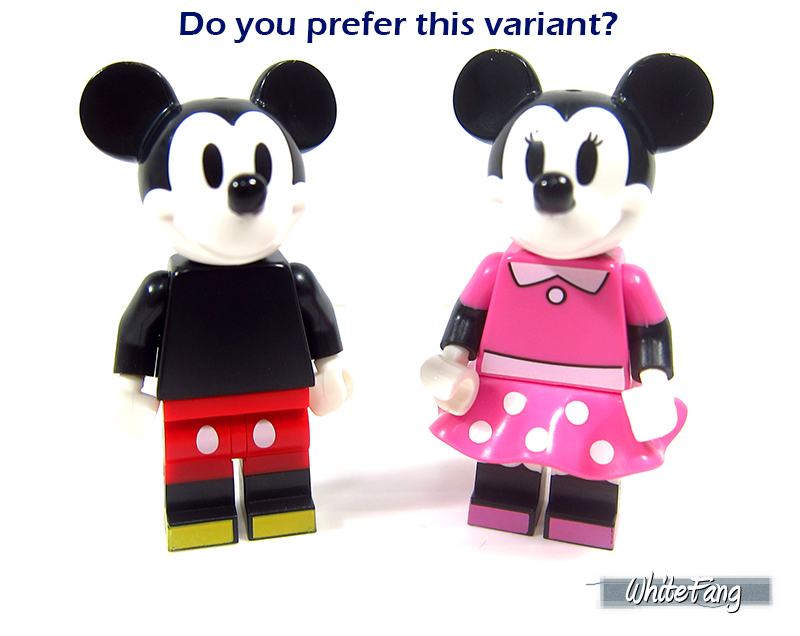 Without further ado, let's bring out the first minifigure design and it is the well known popular Mickey Mouse. In this case, we are presented with a Mickey variant in this vintage style. This Vintage Mickey is comprised of monochrome with a slight tint of grey at his legs. 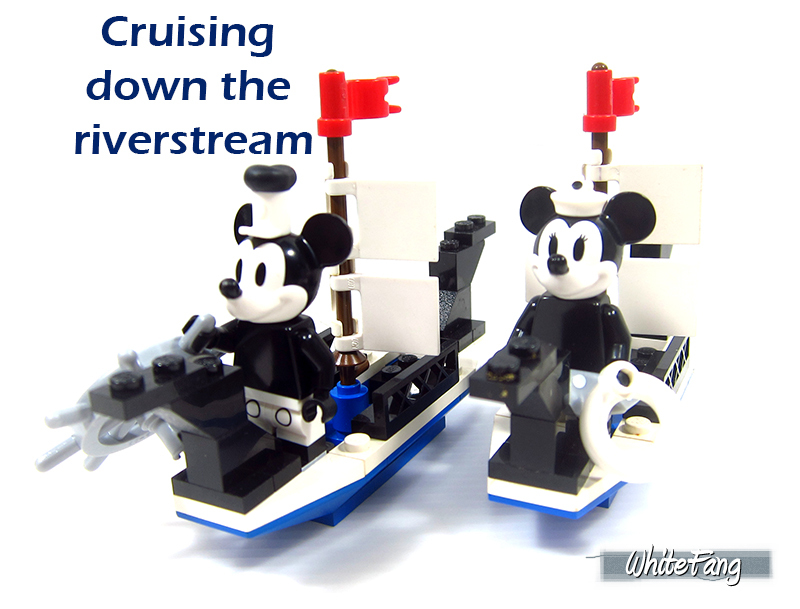 His minifigure entry was ought to be a surprising appearance but yet it was quite a huge disappointment, especially for those who owned the recent LEGO IDEAS: 21317 Steamboat Willie. 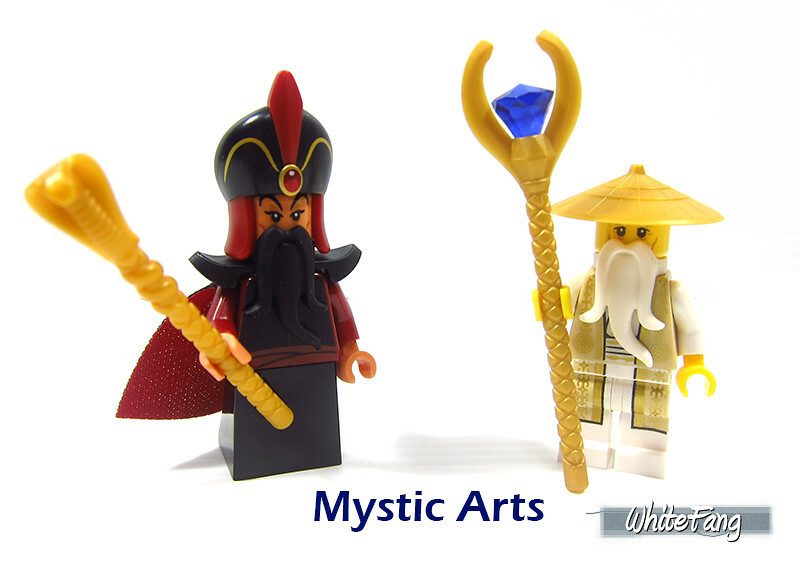 The minifigures are exactly the same from this LEGO IDEAS set which is accompanied with the upcoming second character in this line-up. 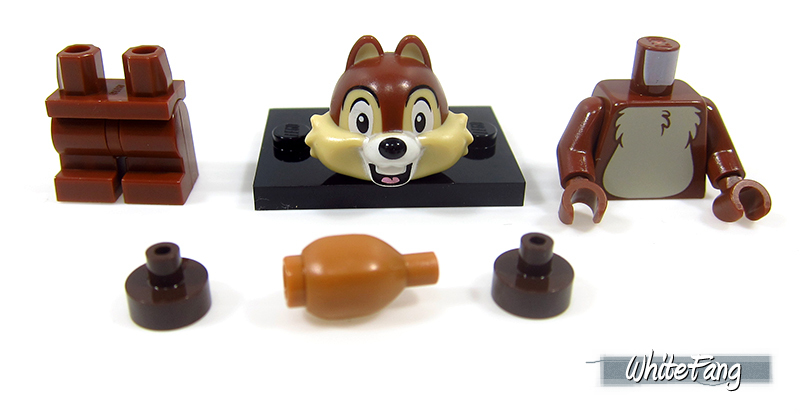 Somehow, his duplicate appearance could have diluted the LEGO IDEAS set through its minifigure cannibalisation. 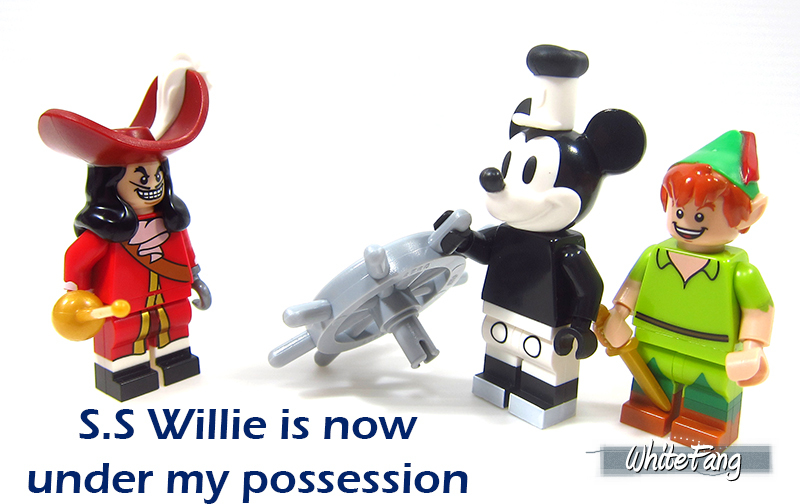 It is either by owning this Vintage Mickey without the need to own the aforementioned LEGO IDEAS set. It was a mixed feeling for me and I thought it will be better for TLG to position other distinct unique Disney character in this series instead. 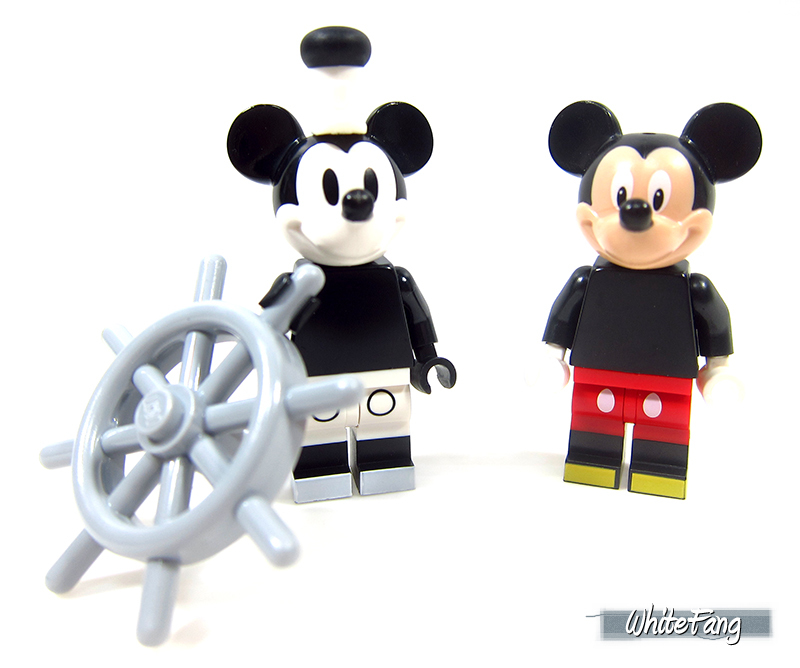 The parts assortment are average and it can be found in the LEGO IDEAS: 21317 Steamboat Willie. The new Captain hat can be placed on top of Mickey's headpiece. While the ship steering wheel can be used for ship building MOCs. You can view more of the details from the all rounded view inclusive of front, side and back view. 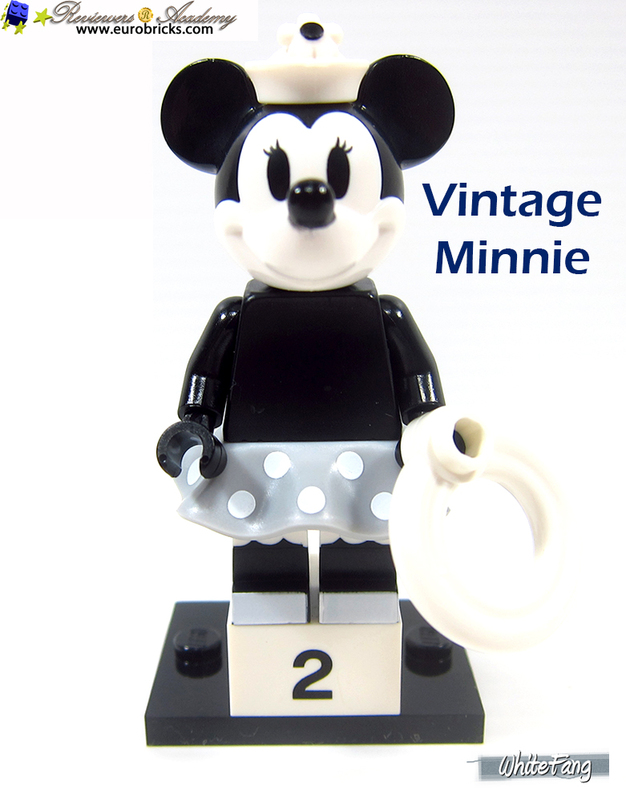 The next in line is Vintage Minnie which also faced the same predicament as the earlier Vintage Mickey. 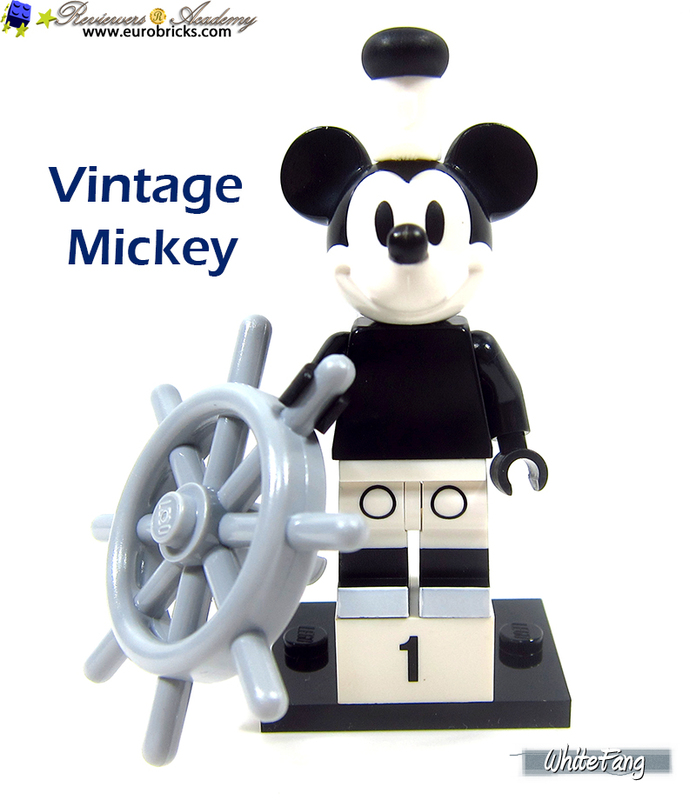 The Vintage Minnie can also be found in the LEGO IDEAS: 21317 Steamboat Willie. 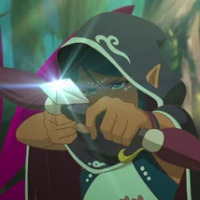 I really wished it can have some slight unique touch or simply replace it with something much relevant and exciting. Otherwise, fans will just view it as a very simple way of acquiring these classic characters which I am not sure if is actually a good idea to begin with. Perhaps, just thinking out loud. 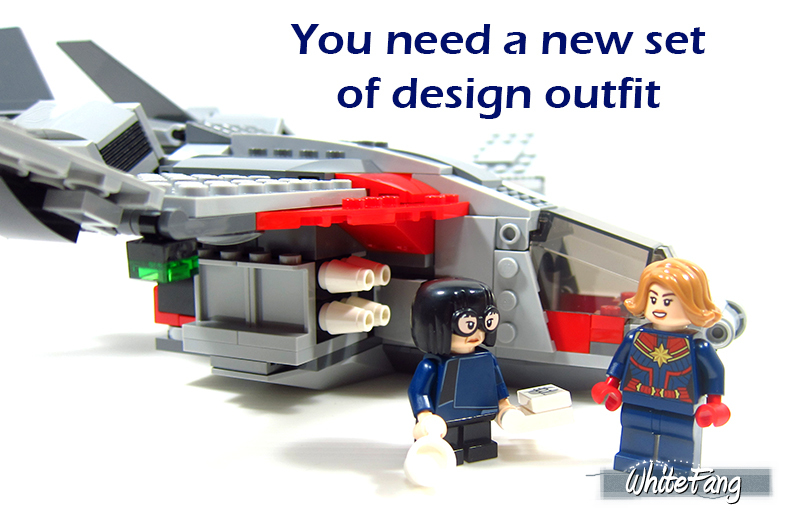 It might be the situation where the cost of production will be better to optimise the same release of designs through other avenues and it just so happen to be under the LEGO Minifigures Theme. To me, I am feeling a bag of mixed feelings. 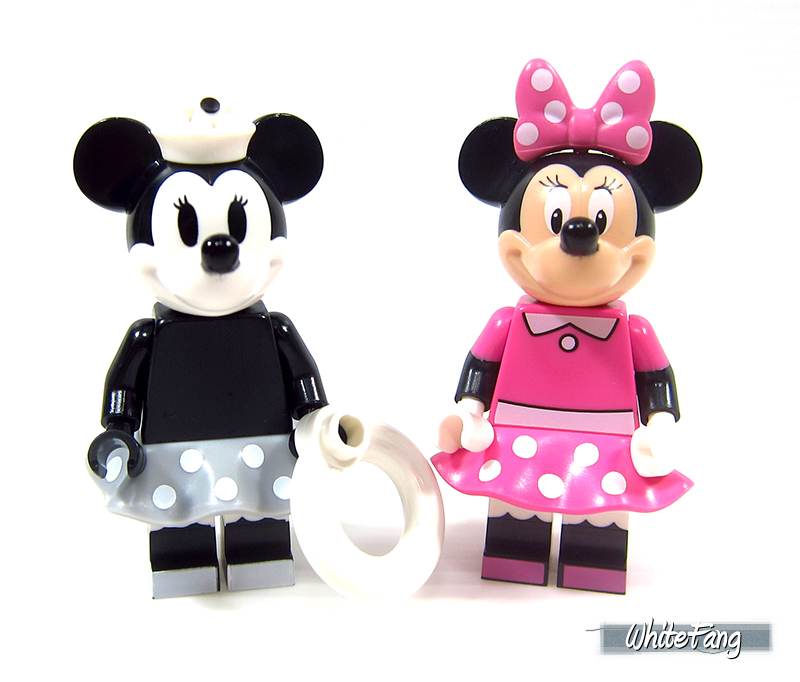 Post-review note: I was informed that the Vintage Mickey and Vintage Minnie had a slight difference in terms of the colours, which is from white to grey from the LEGO IDEAS: 21317 Steamboat Willie. 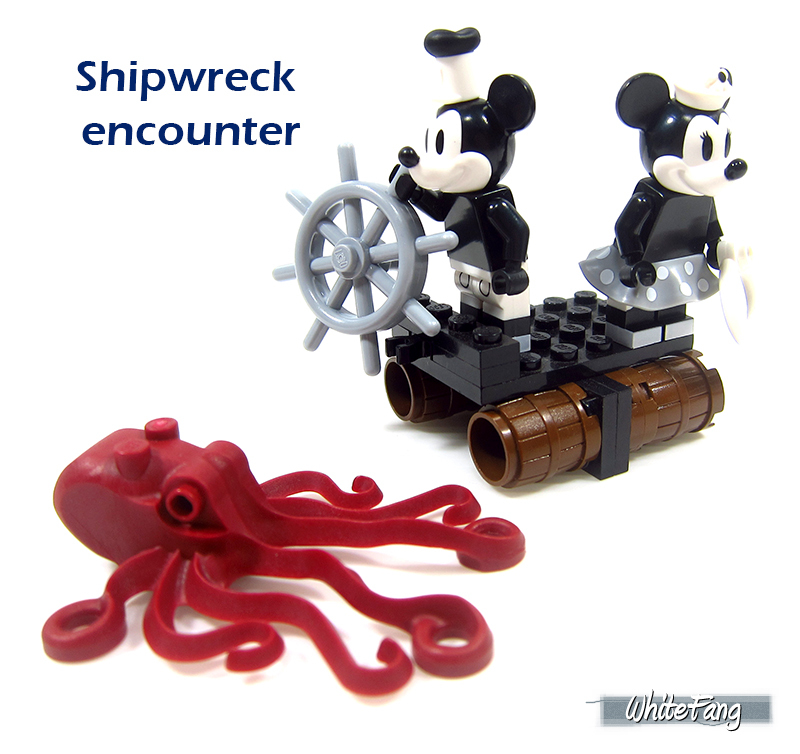 The parts assortment are slightly below average and it can be found in the LEGO IDEAS: 21317 Steamboat Willie. The new lady hat can be placed on top of Minnie's headpiece and it also come with a spare. She also come with a white lifebuoy. The skirt piece with tint of grey and white spots is similar to past Disney skirts designs. You can view more of the details from the all rounded view inclusive of front, side and back view. Do you prefer this variant? 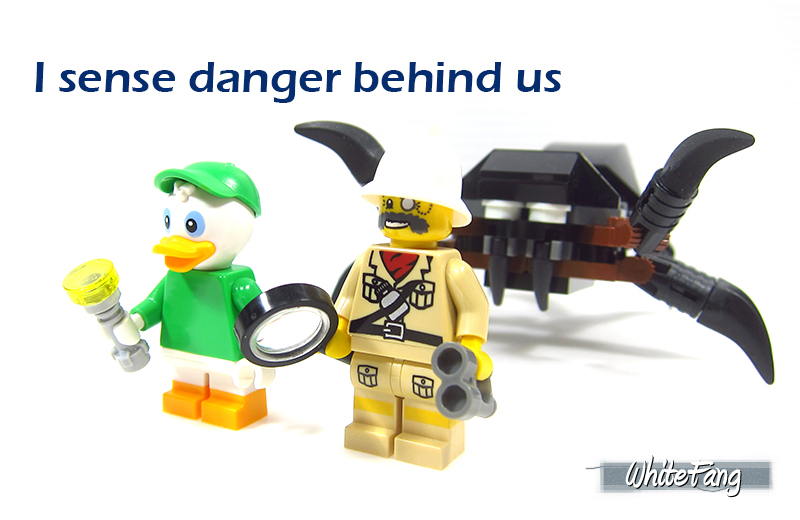 Now, let's focus on the third minifigure in this series which is Huey. He is one of the triplets naughty nephews of Donald Duck and was heavily featured in Ducktales. This Disney cartoon is which I had grew up watching in the late 1980s. His other two companions, Dewey and Louie are featured in this series 2. His design modeled closely with Donald Duck. To represent themselves as children, short leg was used. His red outfit was distinct and closely represented with the original art reference. The parts assortment are slightly above average. 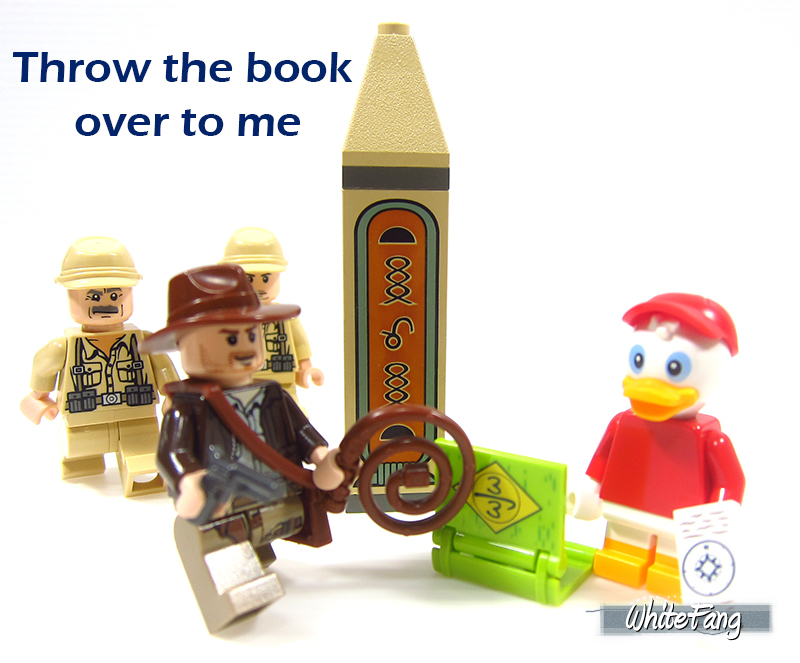 Huey comes with the lime green Junior Woodchucks book and this is a modern book design where a 1x2 printed tile can be attached to it. The 1x2 printed tile appear to be a map or some sort of compass which was embedded within the book. 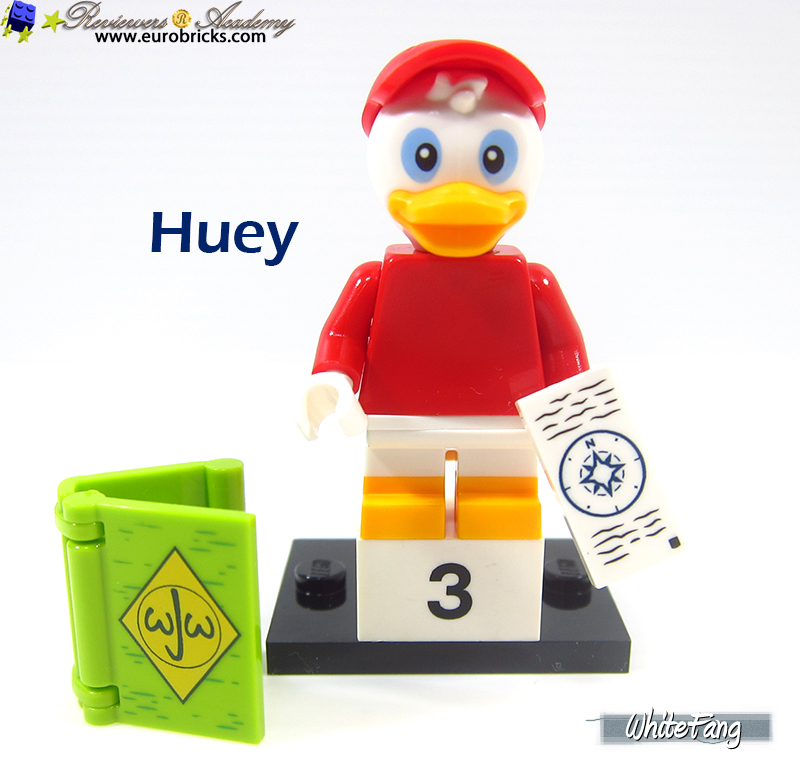 Huey comes with a white fluffy duck tail which can be placed at the back of the legs. The red cap can be inserted nicely on top of Huey's headpiece. You can view more of the details from the all rounded view inclusive of front, side and back view. 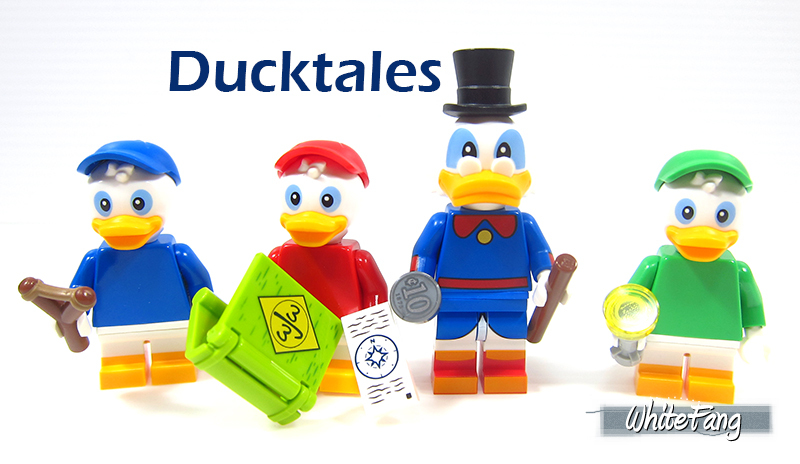 The next Ducktale minifigure is Dewey and is one of the triplets nephews of Donald Duck. They all look very similar and the clothes are the ones which separate them from one another. In this case, I am very fond of the blue outfit of Dewey and he draws fond childhood memories of mine. It is probably because his attire is similar to a mini Donald Duck. Judging by his choice of accessory - slingshot, I can safely guess he is the most mischievous among the trio. The parts assortment are average. Huey comes with a wooden slingshot and there's a spare piece for it. 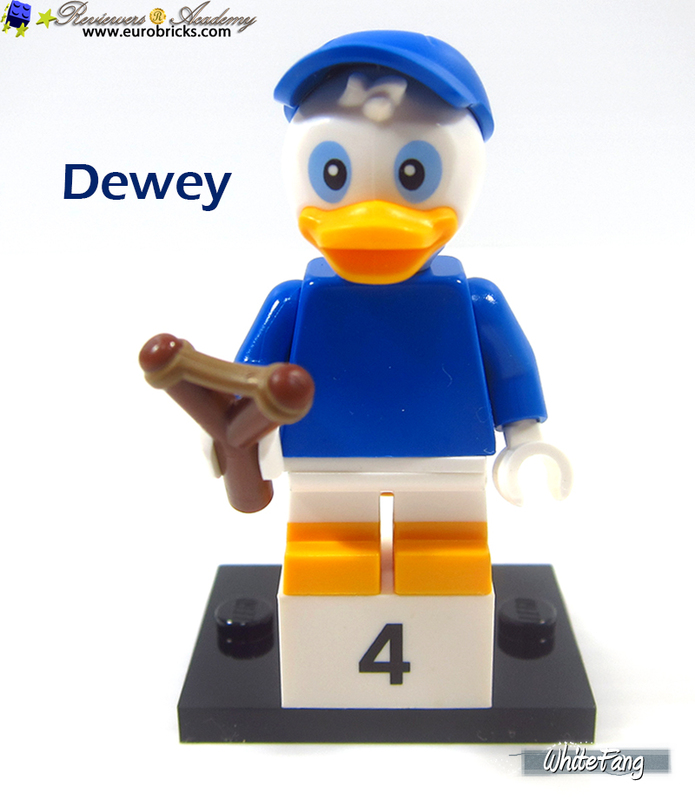 Dewey comes with a white fluffy duck tail which can be placed at the back of the legs. The blue cap can be inserted nicely on top of Dewey's headpiece. You can view more of the details from the all rounded view inclusive of front, side and back view. 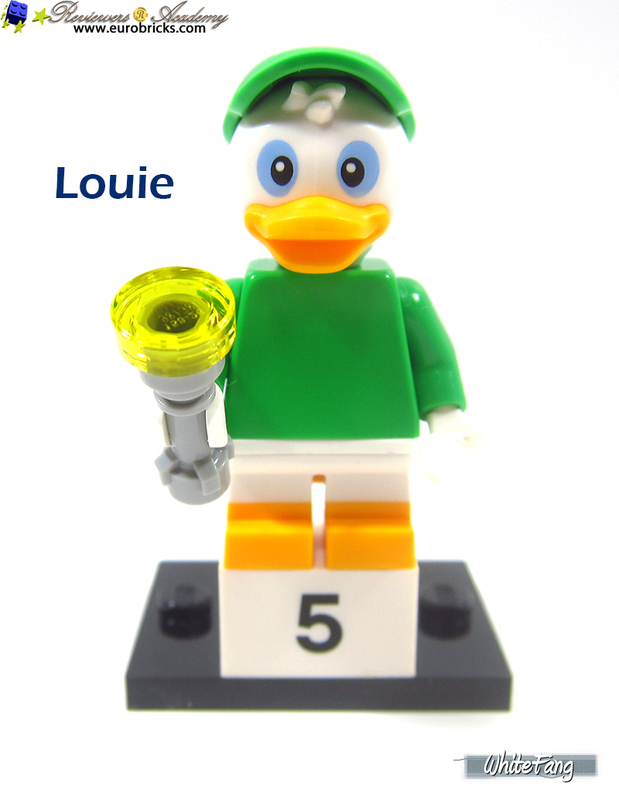 The next Ducktale minifigure is Louie and he is last of the triplets nephews of Donald Duck. Louie donned the bright green outfit. The base design is the same as Dewey and Huey. The only differences are their colours of the capes and torsos. Louie concludes the trio and because of their low distribution count. Many people will probably be searching the above three minifigures to complete the entire Ducktales trio as part of their Disney collection. The parts assortment are below average. Huey comes with a flashlight and there is a spare 1x1 round yellow element. Louie comes with a white fluffy duck tail which can be placed at the back of the legs. The green cap can be inserted nicely on top of Louie's headpiece. You can view more of the details from the all rounded view inclusive of front, side and back view. 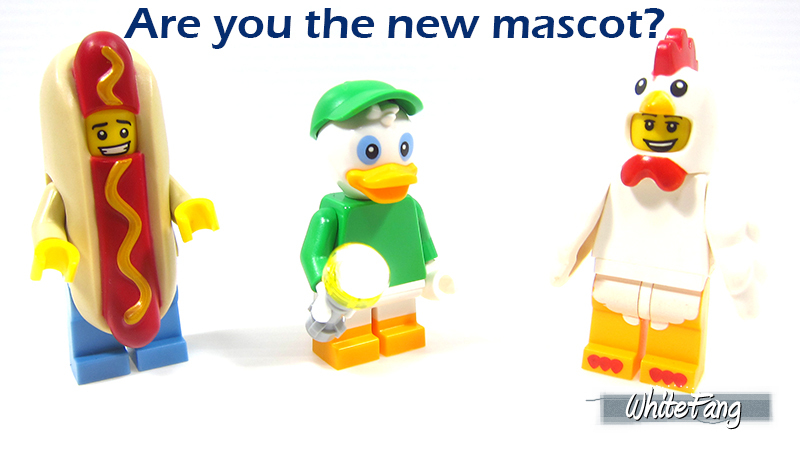 Are you the new mascot? I am also very pleased to see Scrooge McDuck in this series, as it complete the last of Ducktales appearance. 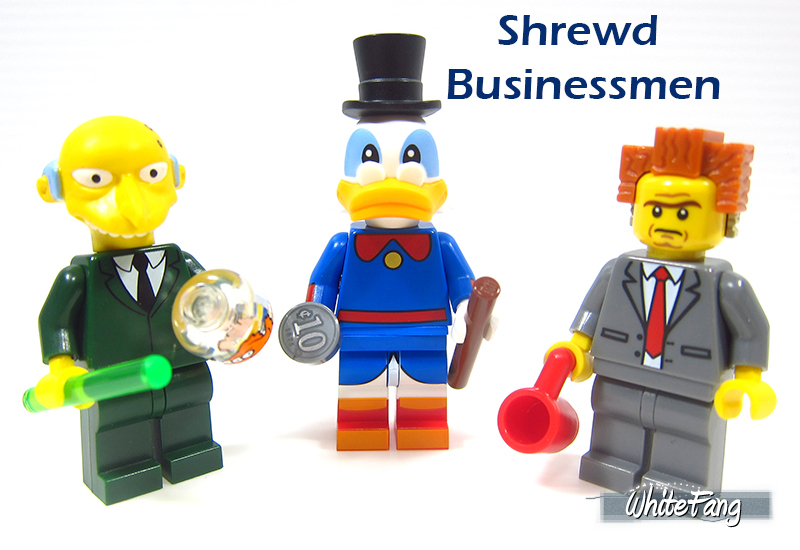 Scrooge McDuck is a shrewd businessman and an adventurous treasure hunter. He is a very successful person and yet appeared to be very stingy. He grew his riches from leaps and bounds. The above design showed a very accurate reference to the original artwork and I am particularly fond of the spectacles near its mouth. In the Ducktale series, Scrooge McDuck adopted Donald Duck's trio nephews after he decide to join the Navy. The parts assortment are slightly above average. Scrooge McDuck comes with a new printed printed coin currency of 10 cents and one of which is a spare. He also carry an wooden stick and it also comes with a spare. 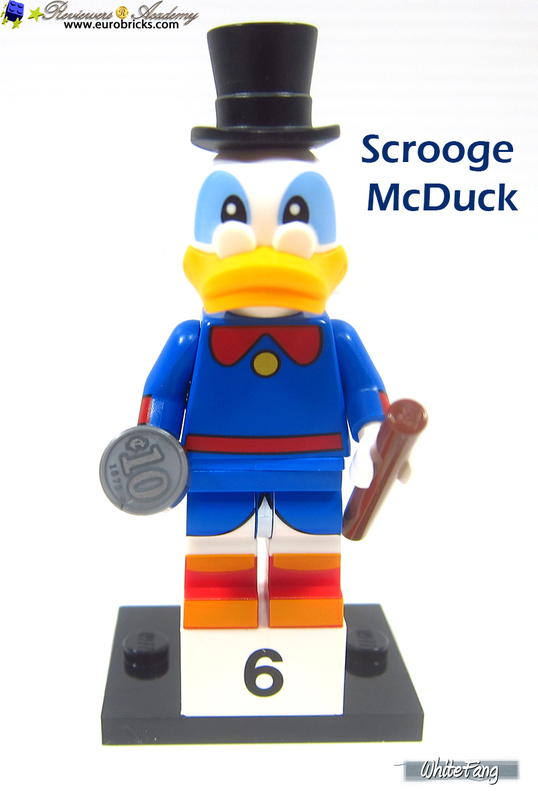 Scrooge McDuck comes with a white fluffy duck tail which can be placed at the back of the legs. Do notice that his duck tail have the blue tint at its front to match the torso and legs colours. The new black top hat can be inserted nicely on top of his headpiece. You can view more of the details from the all rounded view inclusive of front, side and back view. The next Disney Series which we are covering is the Chip 'N' Dale. These may look like primitive chipmunk characters and are often referred as cute stuffy equivalent. Do not fall for their charm. 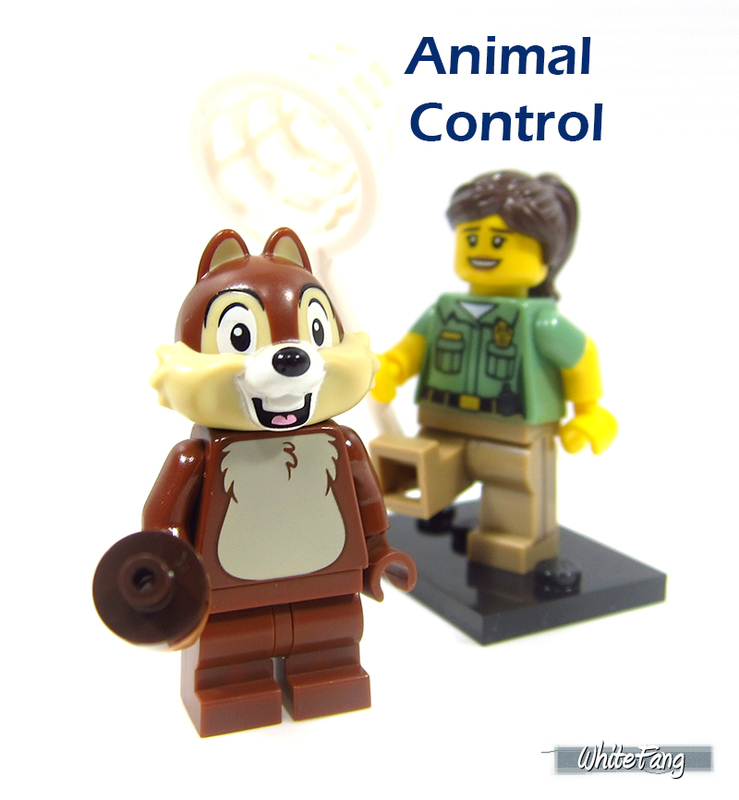 Chip is often portrayed as someone being careful and caution. 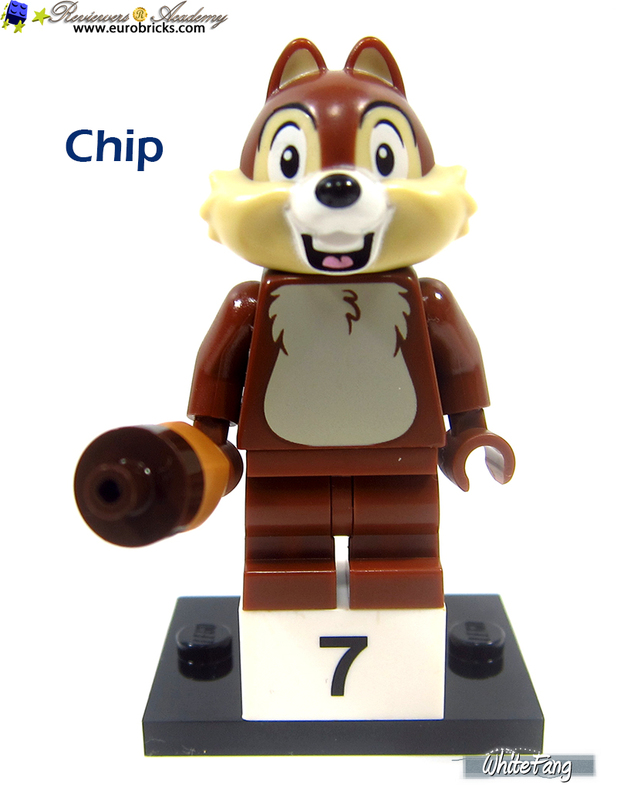 The actual design is very impressive and it can be instantly recognised as Chip with his distinct dark brown furring. For me, I knew this character through the cartoon series of Chip 'N' Dale: Rescue Rangers. The parts assortment are average. The parts for building an acorn is rather simple but a smart use of using Neville Longbottom's mandrake design minus its print. The entire mold is filled with prints especially around its headpiece and torso. You can view more of the details from the all rounded view inclusive of front, side and back view. Did she just cast a transfiguration spell? 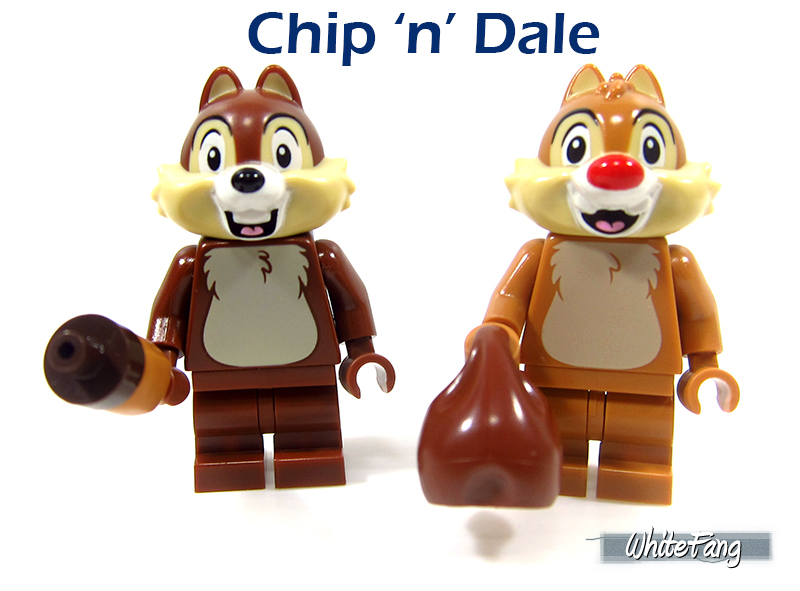 The next Disney character is Dale and he is part of Chip 'N' Dale series. Dale is often portrayed as someone being laid-back and impulsive. The actual design is very accurate and it can be instantly recognised as Dale with his distinct light nougat furring and red nose. For me, I also knew Dale character through the cartoon series of Chip 'N' Dale: Rescue Rangers. The parts assortment are average. He only carried a brown sack to contain his loot. The entire mold is filled with prints especially around its headpiece and torso. Do notice the red nose and the paint can be easily scrapped off. 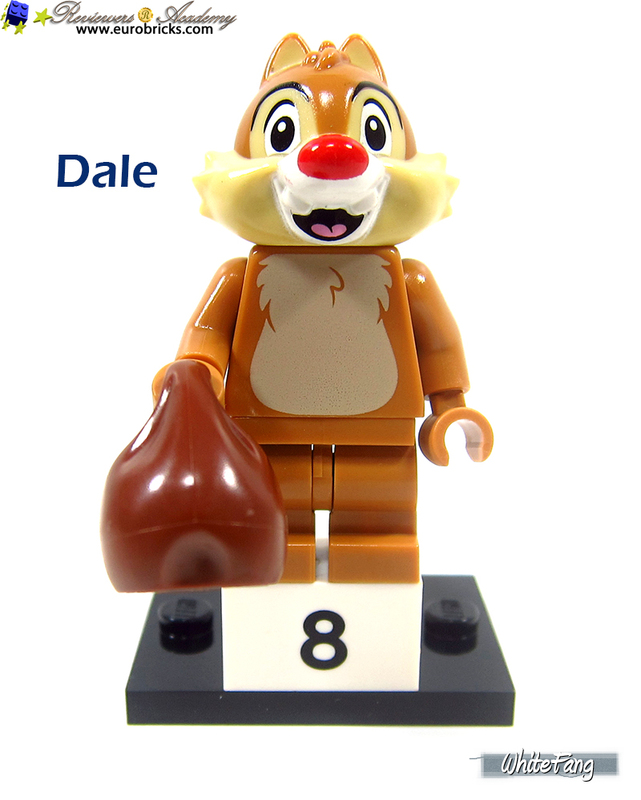 One of the Dale minifigure's red nose was scrapped a little when I opened the bag out of its sealed content. You can view more of the details from the all rounded view inclusive of front, side and back view. 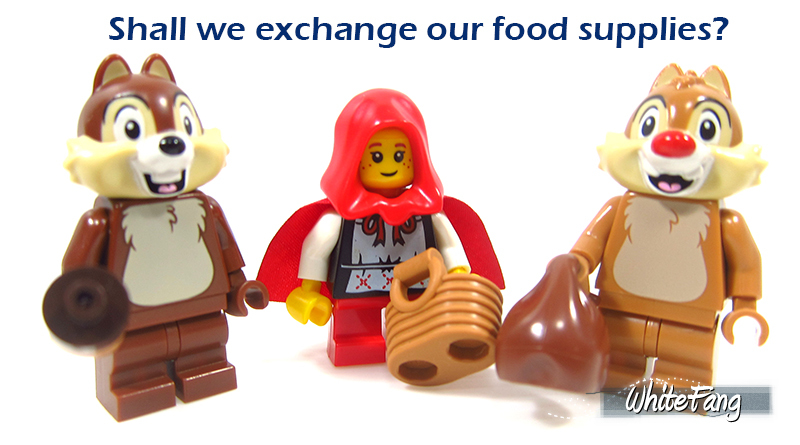 Shall we exchange our food supplies? 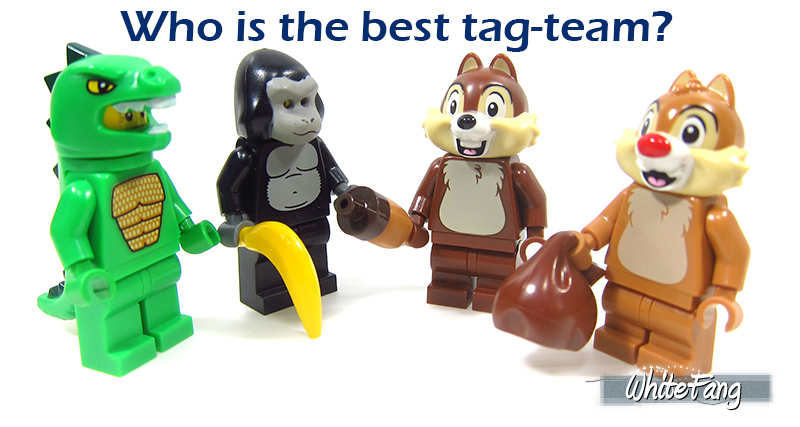 Who is the best tag-team? 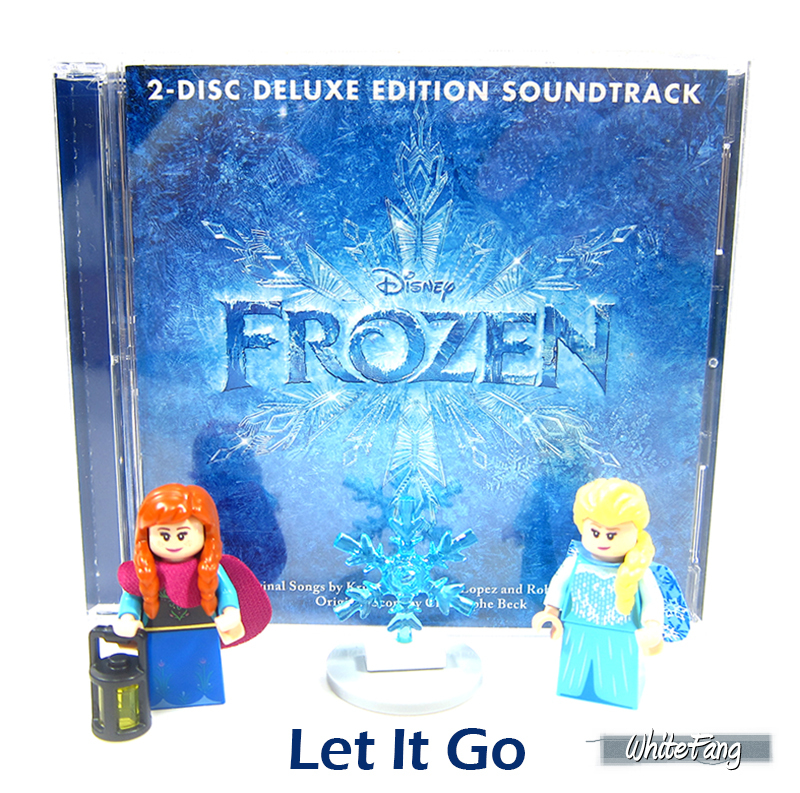 The next Disney Theme is Frozen and it is very popular among children especially girls. This movie had a very nice ringing and contagious soundtrack. The movie is equally pleasing and I particularly like the ending to it. Presenting my favourite character in this series and it is the Queen Elsa of Arendelle. 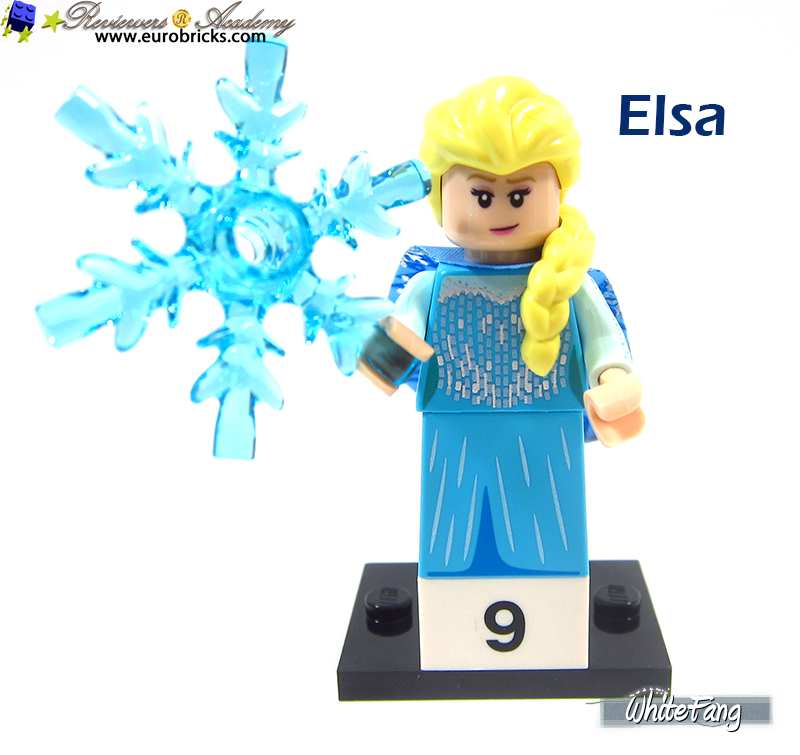 I am very pleased to see a very proper minifigure to it instead of resorting to get this character through the LEGO Disney Princesses series like the 41148 Elsa's Magical Ice Palace from the LEGO Frozen Theme and the figure are modeled after the Friends mini-doll model. This whole dress is particularly attractive and nicely portrayed as well. The parts assortment are above average. It include the nice Belville snowflake which are useful for creating MOC. Her new cape design is shimmering on one side while the other side is matt. Her hairpiece is a new rubbery mold piece. She also comes with a new skirt torso. Her minifigure also encompass detailed printing. 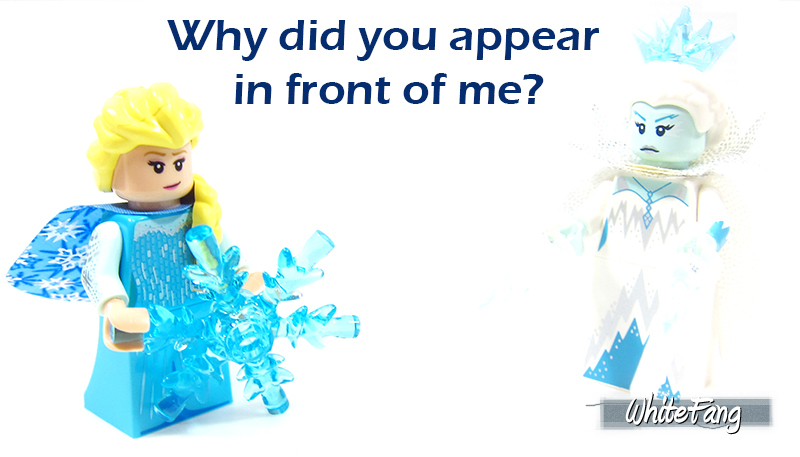 Elsa also contain an alternate facial expression. You can view more of the details from the all rounded view inclusive of front, side and back view. Why did you appear in front of me? 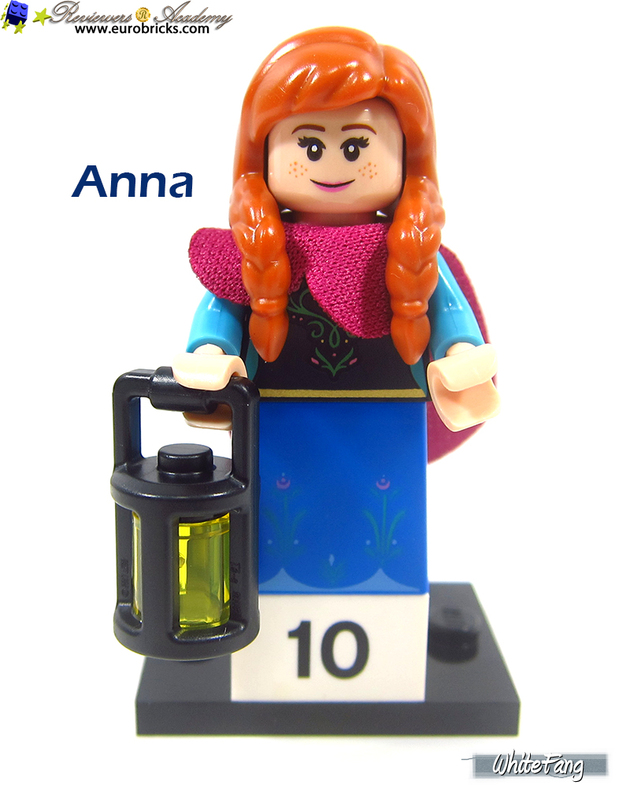 Presenting my next favourite character in this Frozen series and it is Anna who is also the sister of Elsa. 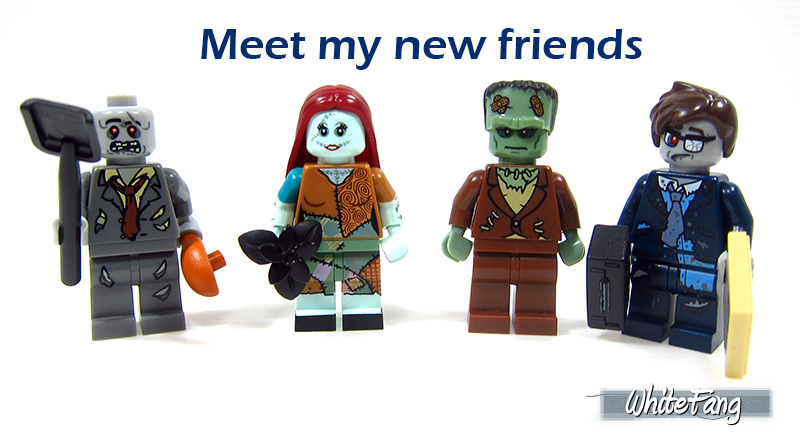 I am equally pleased to see a very proper minifigure instead of the Friends doll model. This whole outfit is instantly recognisable and made good reference to the original artwork in her winter outfit. 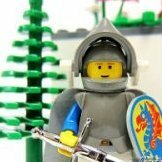 I could imagine using this minifigure well for other medieval MOCs and I trust this will be a popular sought for character as well. The parts assortment are above average. It include the new lamp design which was seen in the recent Harry Potter sets. Her new cape design is pink from both sides. Her braid hairpiece is a new rubbery mold piece. She also comes with a new skirt torso. Her minifigure also encompass detailed printing. Anna also contain an alternate facial expression. You can view more of the details from the all rounded view inclusive of front, side and back view. The next Disney Theme is Aladdin and it is expanded from the first Disney Series 1. I find the inclusion of Aladdin is very timely especially with the upcoming Disney blockbuster movie of Aladdin. Jafar is the antagonist of the Aladdin movie. 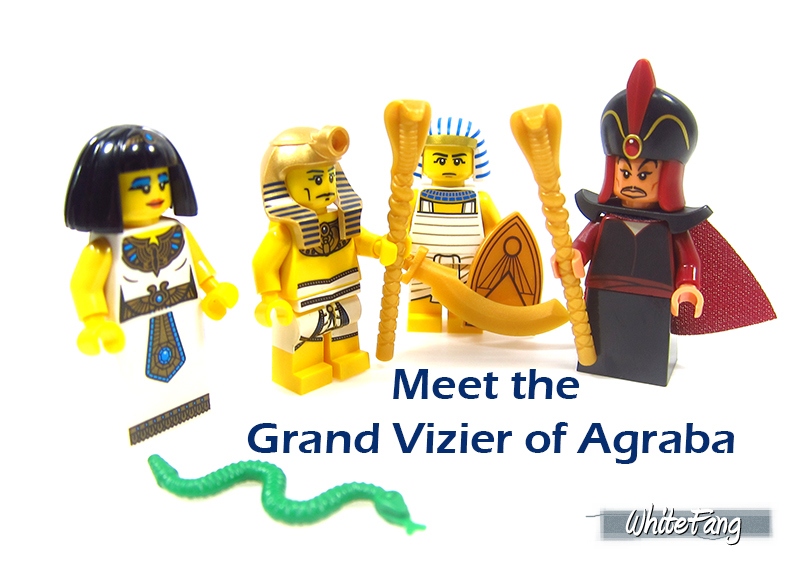 He is the Grand Vizier of Agrabah, the Sultan's most trusted adviser. 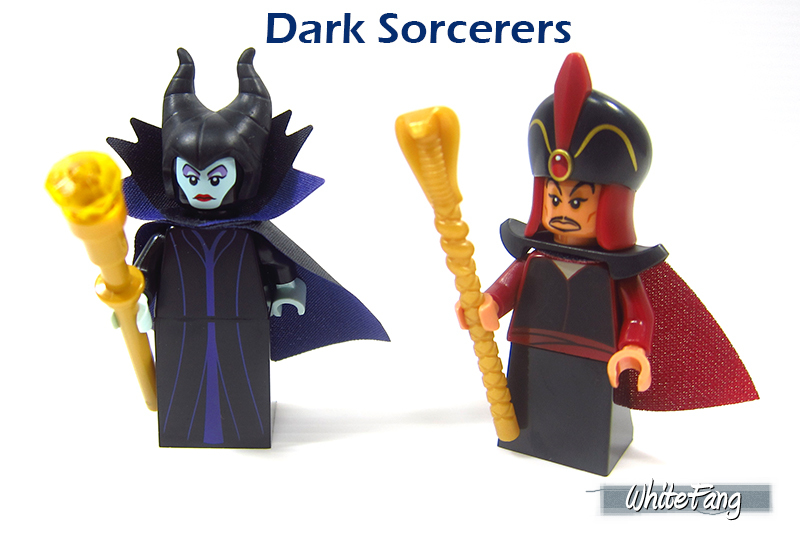 He is also an evil sorcerer who secretly plots to obtain the Genie's magical oil lamp and rule Agrabah. The design is very accurate to the original artwork to depict his dark red and black outfit. The parts assortment are average. It include the existing scepter and black shoulder armour. His new cape design is red from both sides. His turban headpiece is done in a nice grand fashion. He also comes with a new skirt torso. 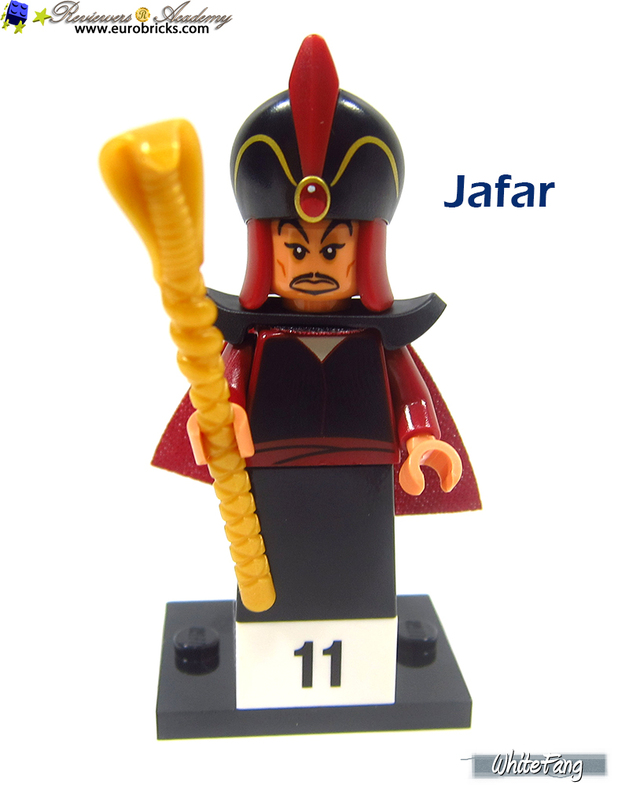 Jafar also contain an alternate facial expression. You can view more of the details from the all rounded view inclusive of front, side and back view. The next Disney character is Jasmine and she is the Princess of Agrabah from the Aladdin. 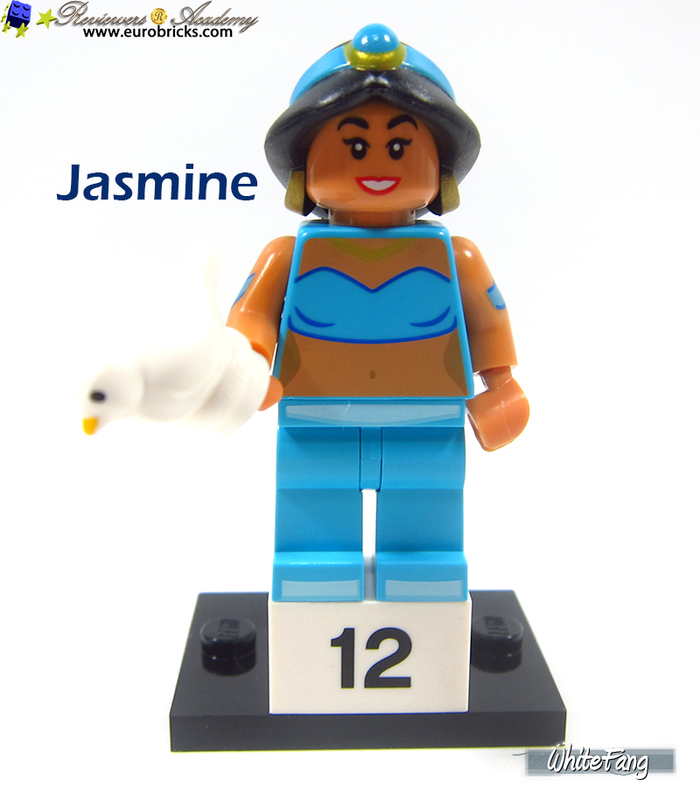 I am very pleased to see Jasmine appeared in a minifigure than its predecessor from the mini-doll design. She had appeared in other Disney Princess sets in the Aladdin theme. Her princess outfit is very accurately done with the original artwork. I am sure this character will add a good array of minifigure design from bustling marketplace to royalties. The parts assortment are average. It include her new pet bird which was first appeared in the 41161 Aladdin's and Jasmine Palace Adventures. Her long black tied hairpiece is made of soft rubbery material. You can view more of the details from the all rounded view inclusive of front, side and back view. 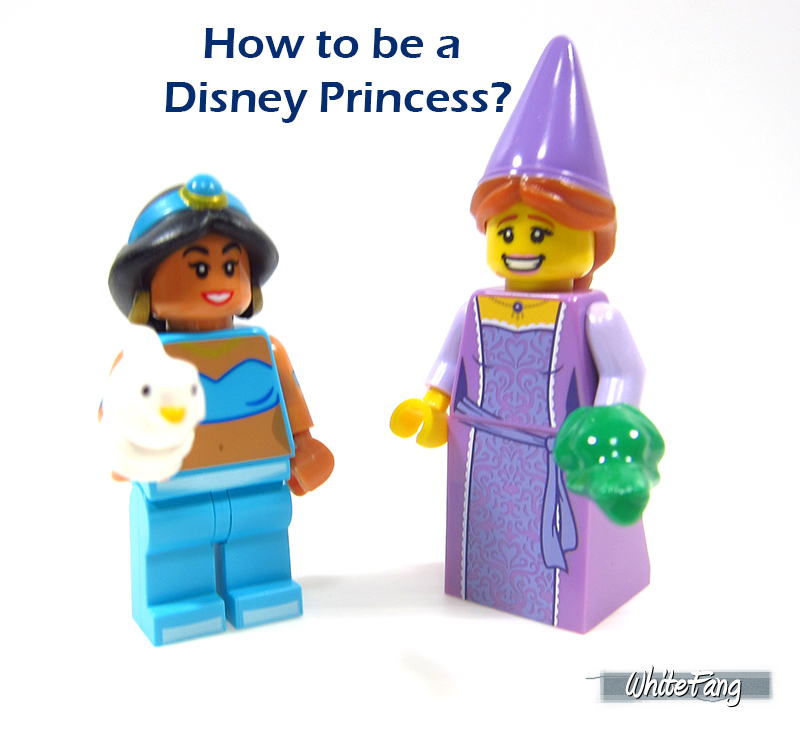 How to be a Disney Princess? The next Disney theme is from Hercules and I find it very surprising this theme is included in this series. It was quite an unexpected surprise. Hades is the main antagonist of Hercules animated movie. 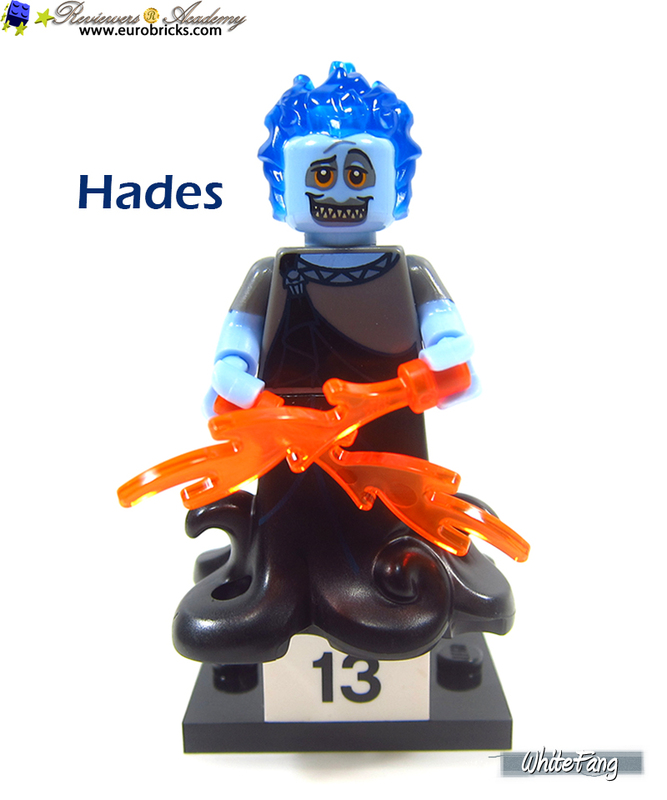 He is a smooth talker, God of the Underworld with a fiery temper and a vendetta against his eldest brother, Zeus. In secrecy, Hades hatches a scheme to take over Mount Olympus, but a prophecy foretells that a hero will rise against him and end his reign. Hades can be truly employed in various evil looking customisation since his outfit reek of scheming from top to bottom. The parts assortment are average. 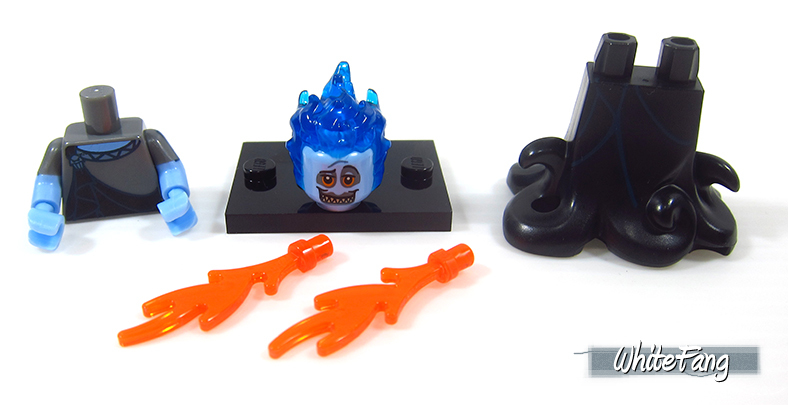 The flame pieces are common LEGO parts and it also come with a spare. The fiery blue flame on his head cannot be removed from his headpiece as it is glued together. His bottom is similar to Ursula but is entirely a different mold. You can view more of the details from the all rounded view inclusive of front, side and back view. 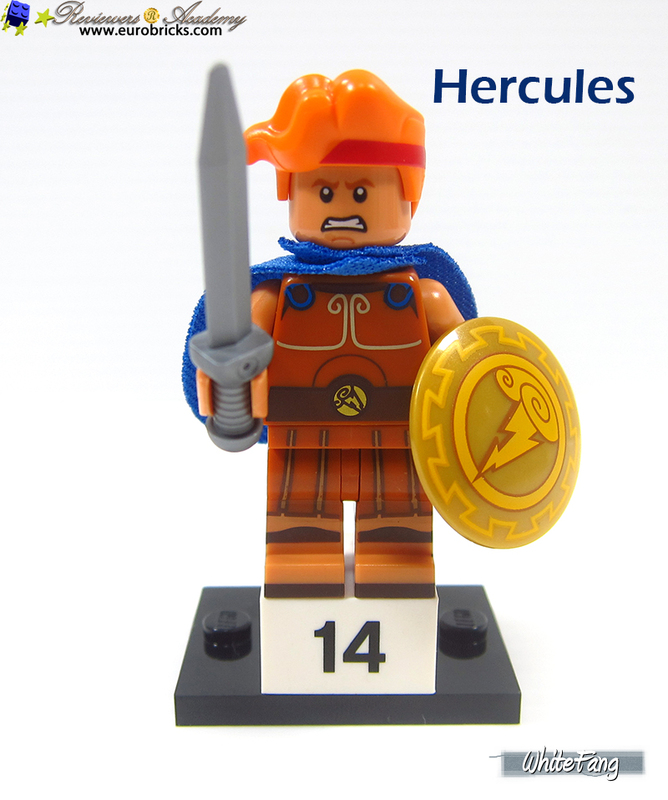 Hercules is the main protagonist in this series and he is one of my favourite character in this outfit. His muscular strong vest of weapons arsenal are very impressive and versatile. The Disney version of Hercules had very little relevance to the original Greek Mythology. Suggest you to watch the movie to see the actual difference with an open mind. The parts assortment are above average. The swords come in pairs and one of it is a spare. The circular shield is the eye catching and useful medieval piece of accessory. It also bear the symbol of lighting similar to Zeus wield the lighting bolt. 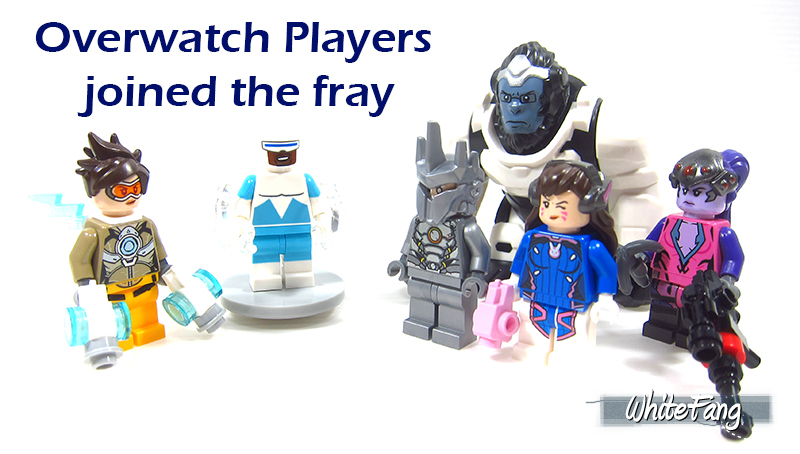 It also come with a new light blue cape. 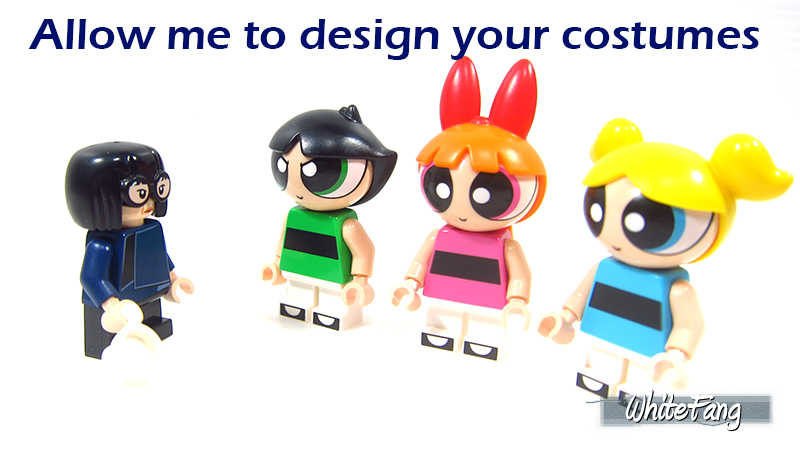 The bright orange hairpiece is also a new mold. I am very impressed with the all rounded printing on his legs and torsos. Hercules also contain an alternate facial expression. You can view more of the details from the all rounded view inclusive of front, side and back view and without his cape. 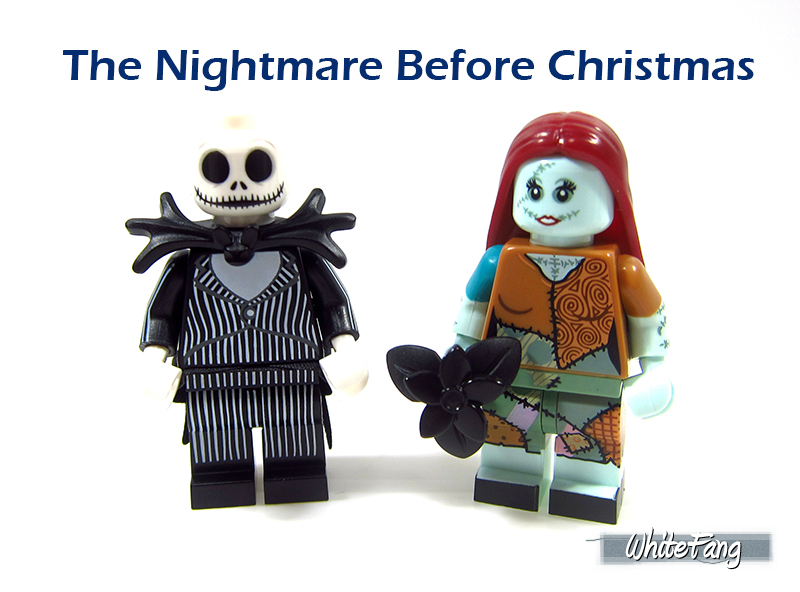 The next Disney theme is the Nightmare Before Christmas. I never knew this Tim Burton's movie was part of Disney franchise. It is interesting to see how a fantasy Halloween Town filled with monsters which we are familiar with. 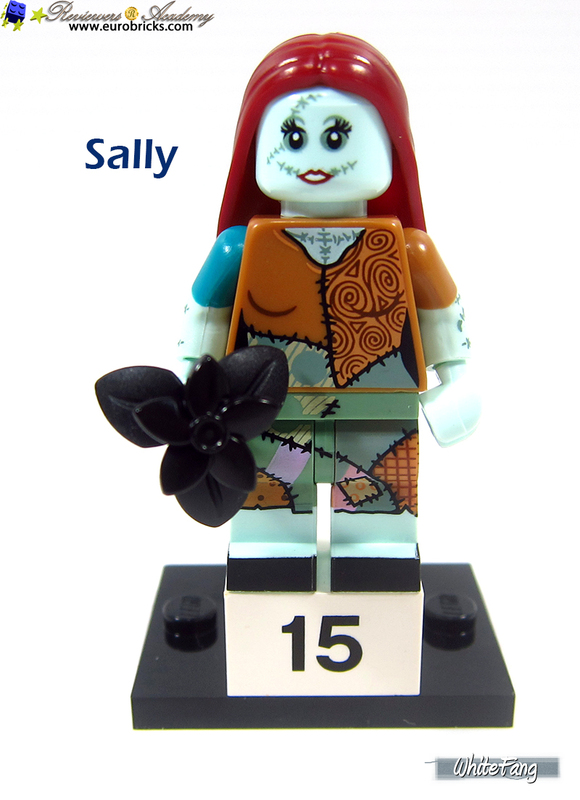 Sally is surprisingly nice looking in this minifigure design who is a rag-doll woman that is secretly in love with Jack Skellington. Her rag-doll design with its seem-to-be various patches sewn together are some amazing details in this design. The parts assortment are slightly above average. The black flowers and petals come in pairs and one of the pair is a spare. Those are some nice new assorted decorations which can be useful. She also has a new hairpiece with long red hair. Sally also contain an alternate facial expression. You can view more of the details from the all rounded view inclusive of front, side and back view and back printing with her hairpiece removed. 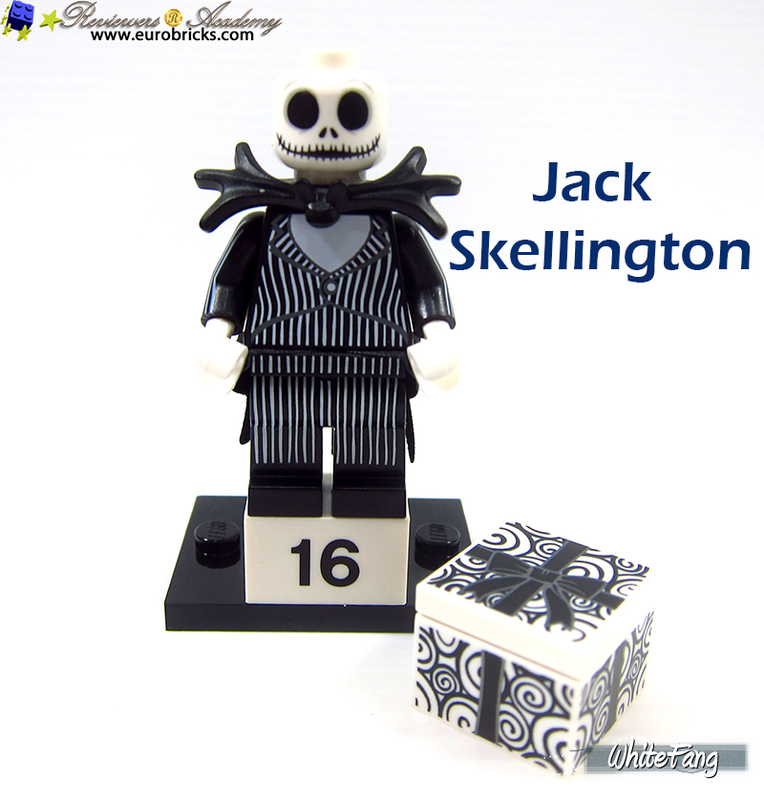 Jack Skellington is the main protagonist in the Nightmare Before Christmas. He is also known as the "Pumpkin King" and leader of the town and usually in charge of organising the annual Halloween celebrations. This minifigure is very well design with the long black suit with white lines drawn from the top to his pants which is visible from his sides as well. The parts assortment are above average. He has an amazing gift box of 2x2 printed with snowflakes design of 1x1 round tile that can be kept inside. The box allow two of such round tiles inside and the remaining two are spares. The shoulder blade contain a black bow-tie and his bottom has a cloth waist around his back. He does not have a hairpiece and his skeletal head is a new facial design. You can view more of the details from the all rounded view inclusive of front, side and back view. The last Disney theme in this series is the expansion of The Incredibles from the former Disney Series and the recent LEGO Juniors theme of The Incredibles 2. 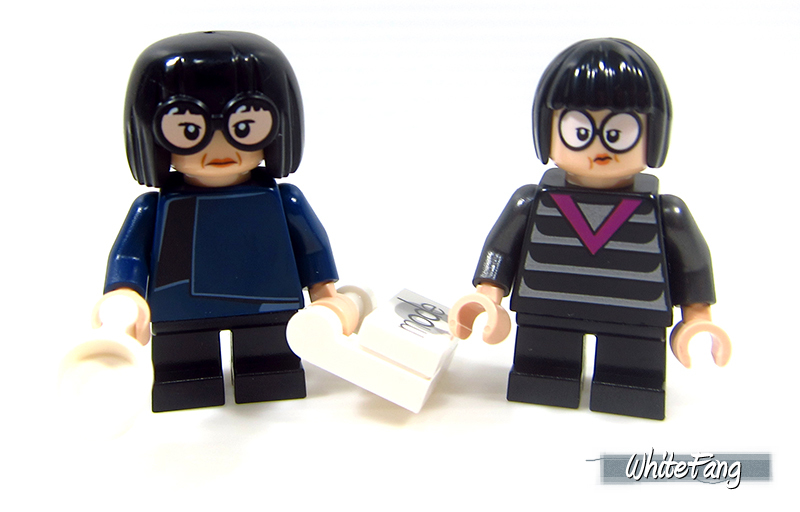 I am very pleased to see an improved design of Edna Mode unlike the one from 30165 Edna Mode polybag. 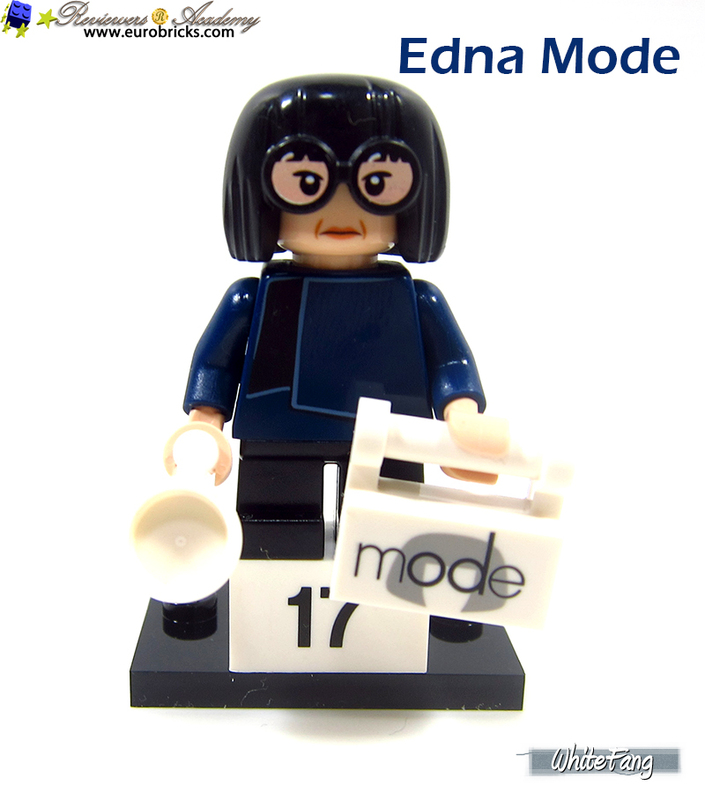 Edna is an outstanding superhero fashion designer and her prized works include the original superheroes designs for the Incredibles family members. The parts assortment are slightly above average. She comes with a pair of white tea cups and one of which is a spare. Her tote bag also included a 1x2 printed title with her own surname and logo printed on it. The excellent hairpiece is done nicely with her eyes expression and spectacles placed in such distinct fashion. Enda mode contain an alternate facial expression and if you done some changes to it with the former, this will be the outcome. You can view more of the details from the all rounded view inclusive of front, side and back view. The last character in this Disney Series 2 is Frozone from The Incredibles. He is also known as Lucius Best and is one of the supporting characters of The Incredibles. He is the best friend and a close ally of Mr. Incredible. He has the ability to create ice and freeze surfaces with his hands. This character will certainly pleased many fans of The Incredibles which will add right into the midst of the other similar minifigures of The Incredibles. The parts assortment are slightly above average. 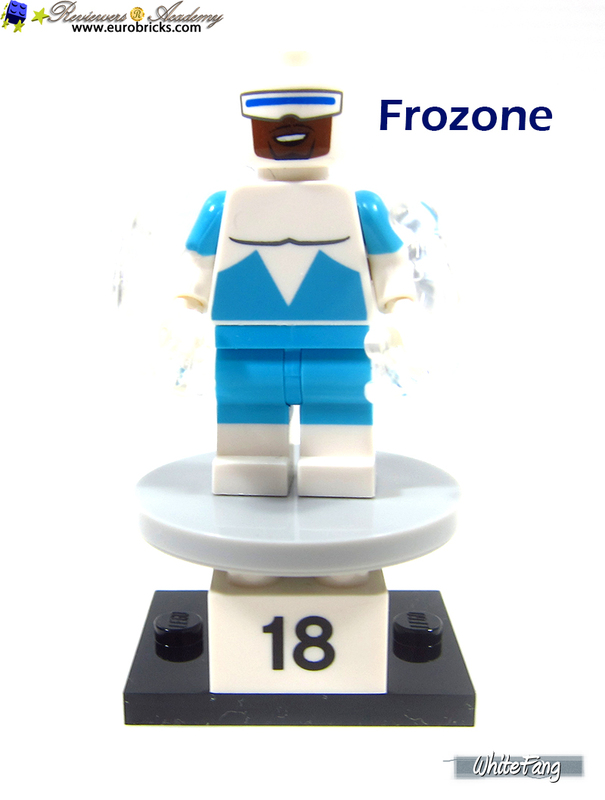 He is given a pair of transparent energy blasters to simulate ice freezing.The 4x4 circular round disk is a very uncommon piece and I am very pleased to see it appeared as Frozone base. By placing the white jump beneath the disk, it will create an illusion of it floating. You can view more of the details from the all rounded view inclusive of front, side and back view. 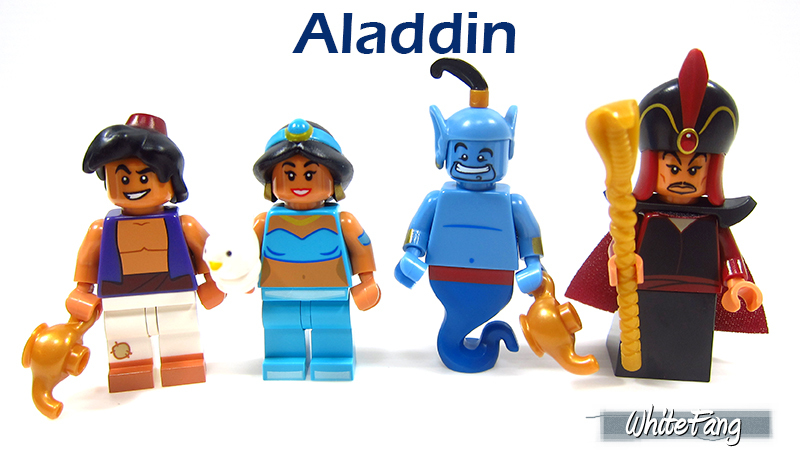 To conclude, the LEGO Minifigures - The LEGO Disney Series 2 is a specialised CMFs release featuring a total of 18 minifigures with 16 brand new designs of the Disney universe and 2 rehash characters from an existing LEGO IDEAS set. The biggest pull factor is the amazing design and artwork which are closely referenced with the original artwork across these mentioned themes. This second series is an outstanding release is a force not to reckon with which complement well with the first Disney series. On the whole, I would said this is a remarkable release despite of the disappointing distribution ratio of 2 complete sets in a sealed box which resulted in a large number of spares of other characters. Furthermore, I also noted this series lack of the minifigure neck marking which can increased the tightness and grip of the head and neck. This was seen in the previous series of the LEGO Minifigures - LEGO Movie 2 Series. Traditional LEGO CMFs series had always appeal widely to the masses. I really wish to see the next series moving back to its traditional charm. One thing for certain is TLG is not really intending to just focus on the traditional stuff. There are already clear signs in the shift in their marketing and design approach. 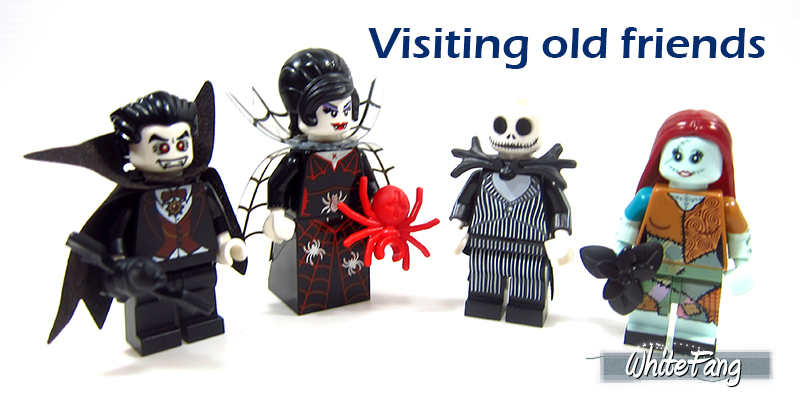 Time will tell if the change in the LEGO CMFs could sustain and continue to appeal to general public and LEGO fans. It is not an easy theme to continue create, design and introduce many new creative and original designs for each new series. 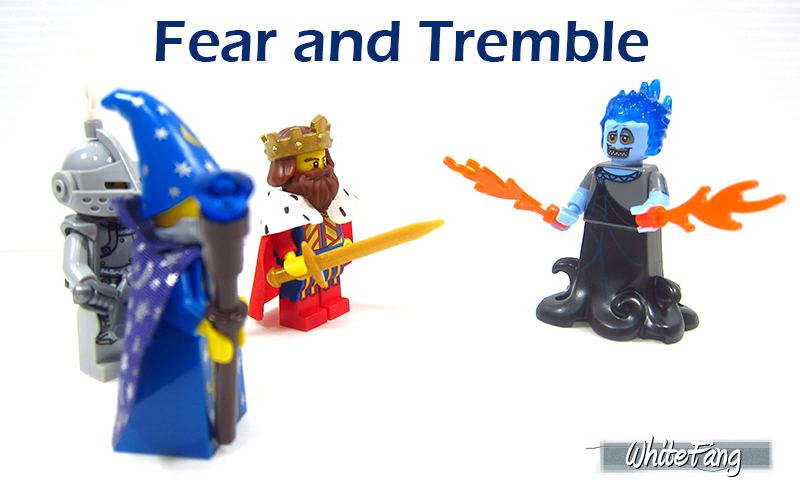 The LEGO Collectable Minifigures Series or known as LEGO Minifigures Theme shall always be a rare commanding class of their own, which distinguish themselves from regular LEGO Theme and special releases. It has been a very long standing tradition and yet they are able to retain the charm and excitement, until today and I am not out of interest yet. Now with a total of 476 minifigures released for the entire Series 1 to 18, the LEGO Movie Series & the LEGO Movie 2 Series, LEGO Simpsons Series 1 to 2, Disney LEGO Minifigures, LEGO Batman Movie series 1 to 2, LEGO Ninjago Movie Series, LEGO Harry Potter and Fantastic Beasts Series and the current LEGO Disney Series 2, not including Mr. Gold which unfortunately I do not have the blessings or lucky stars to own it till this date, and the special exclusive Toy Soldier and Zombie Skateboarder minifigures that can only be obtained through The Minifigures Character Encyclopedia books respectively. At such accelerated releasing rate, I wonder what is everyone's display plan and if they can keep up with the display shelving area for future expansion. For myself, I had already done a nice display for my own CMFs and with this new series, I had maxed out my current display, as seen above. I will need to work something out in order to accommodate future releases. Meanwhile, I really wonder what exciting new series will TLG have for us. Only time will tell and let's be patient about it. I am confident that it will be worth the wait as always. 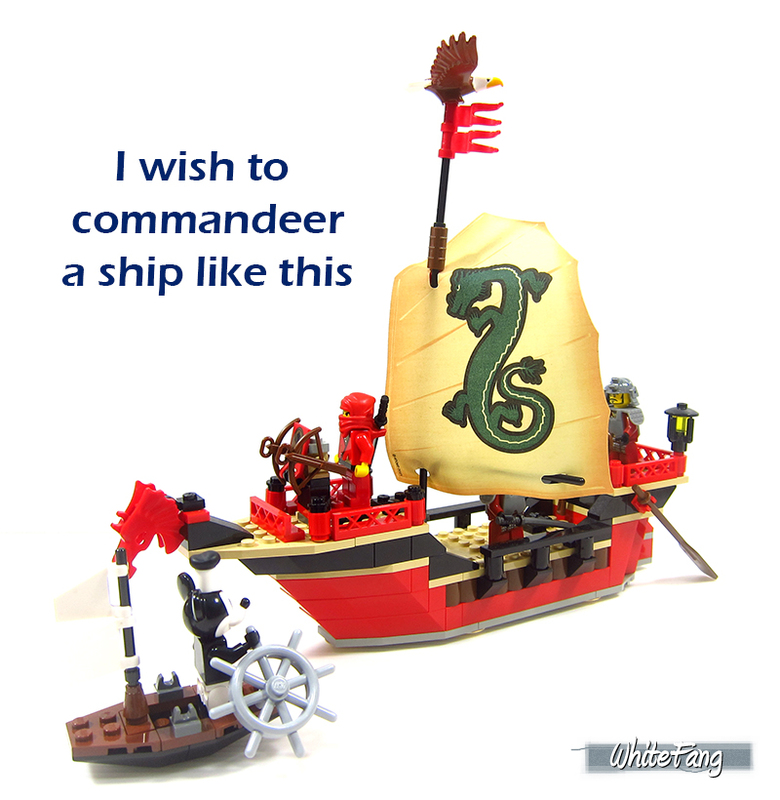 Please note that all opinions and content shown in this Eurobricks pictorial review is from 'WhiteFang' and is not meant to represent LEGO official views. It is purely stated to share as a vantage point of a reviewer. 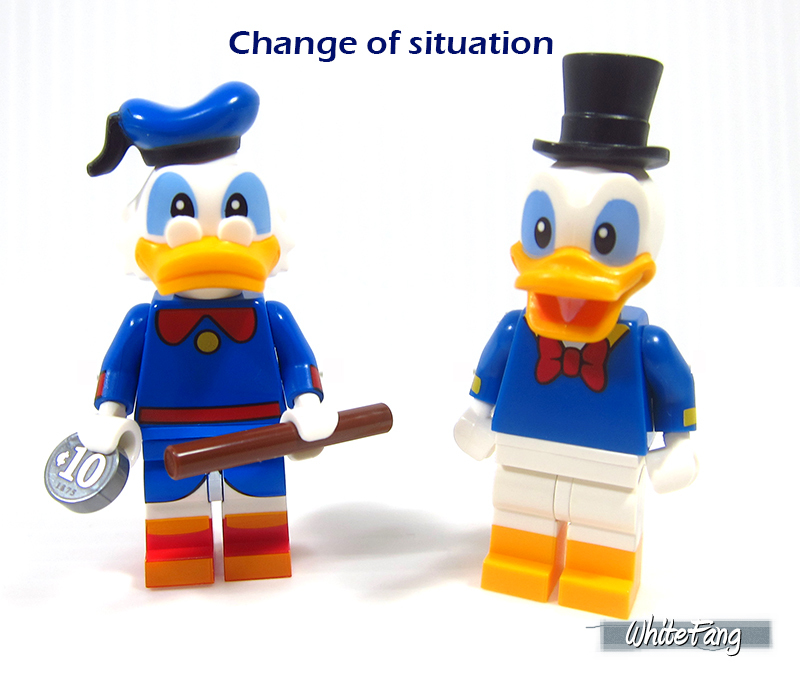 Please note that the The LEGO Minifigures - LEGO Disney Series 2 contain useful spare parts/accessories. The overall spare parts can be seen here. I gave it a "5" based on my Review Score Card. What about yours? I hope everyone of you enjoyed reading this simple review of mine. Comments and Criticisms are welcomed. Pictures can be found in My Flickr. 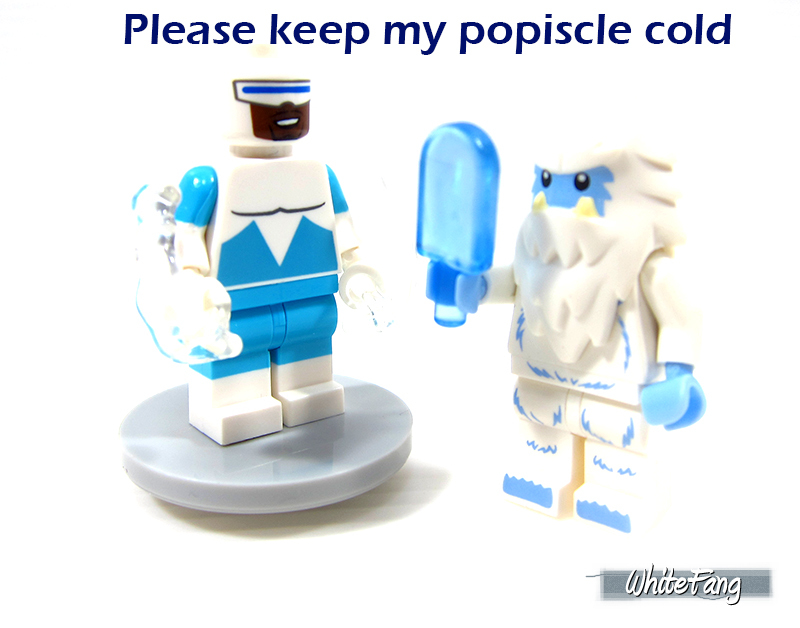 If you are interested to read the past LEGO Collectable Minifigures Series reviews, you may find the following links below! 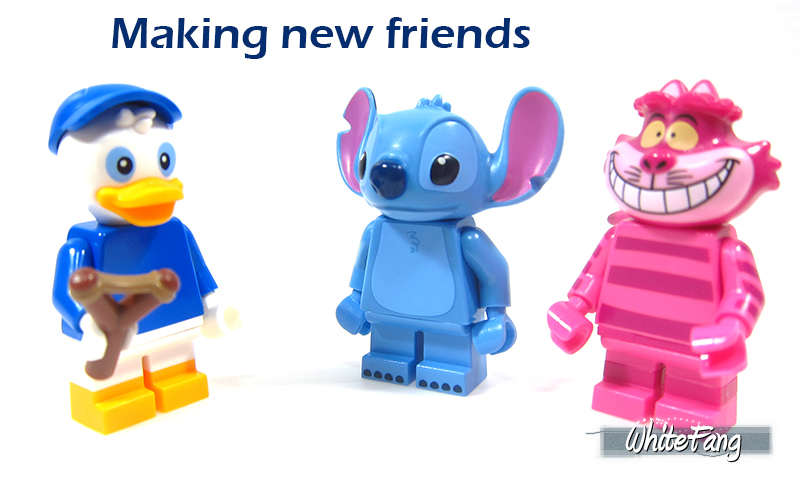 I am very pleased to share with all of you my newest review work on the LEGO Minifigures - LEGO Disney Series 2. It took me almost a week to put this together since I received it from TLG on April Fool. Eurobricks is not the only community doing this review and there are many other communities had released theirs. I sincerely hope my latest reviewing work continue to excite all of you in this highly anticipated LEGO Minifigures Theme. Feel free to leave your thoughts and comments. Holy cow, what a summary of the new Disney figures! Thank you very much for doing another detailed and in-depth review, WhiteFang! I will surely won't buy all of them, but completing the ducks and the characters from the incredibles I can't resist. The most disappointing figs are the 'vintage' mice (honestly? vintage? Why on earth...?) and Louie because of his uninspired lamp. Who doesn't love a Retro Spaceman? Say, does Scrooge McDuck's tophat work on Mickey's/Minnie's head, or does it not fit in between the mold's ears? For that matter, while I'm presuming it works just fine with Donald's/Daisy's head, how about Huey's/Dewey's/Louie's head mold? P.S. I never noticed in other reviews of this Series how Jasmine's torso is done. I mean, why? Can you imagine if Series 1's Ariel was executed in the same way? Have no fear, Series 19 may be here this September! Great review as always. To me this is almost a perfect series. Traditional LEGO CMFs series had always appeal widely to the masses. I really wish to see the next series moving back to its traditional charm. The two Frozen characters has some good pieces for a medieval setup - but other than those, there's not really anything of interest to me. I hope we'll see a proper series 19 next. Although I have read other reviews about this new series, I was checking Eurobricks everyday to read yours!! An interesting series, but as other people, waiting for a traditional one. When I saw the Steamboat Willie I was nervous, because I wanted the minifigures and not the set (which was expensive), but this series gives me the opportunity of having the traditional Mickey and Minnie. Do not have mixed feelings. Feel happy, we do not have to buy that expensive set!! 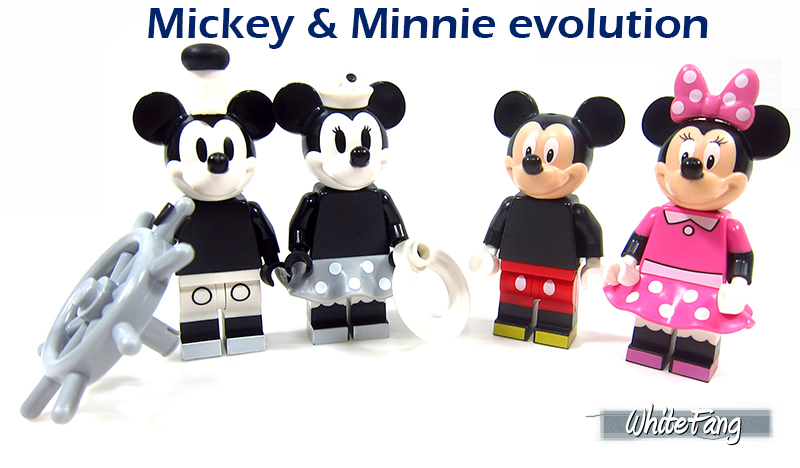 However, some say that the grey colour in Mickey and Minnie are different, so it would be interesting to compare the minifigures. Thanks for the review. Some great characters like Jack, Jafar, Hades, Sally, Hercules, Chip and Dale. Definitely getting several of these and multiples of many of them too. Brilliant review as always .. does anyone know the reasoning behind Hades ( and Ghost Rider ) hair being glued on ? Do you have any Friends hairpieces that you could try the hats from various characters on? Would be eager to see how some of these hats look with hair, particularly Huey, Dewey, and Louie's baseball caps. I don't think it's glue, I think it's a single "2K" (two-component) element in which the second color is molded directly onto the first (same as many of the Simpsons minifig heads, two-colored minifig legs and arms, or two-colored Ninjago ninja masks). If I had to guess the reason for doing it this way instead of as a headgear piece, I suspect it's a matter of the part where the fire meets with the sides of the head coming to too sharp a point to meet quality standards if molded in polycarbonate (the plastic LEGO uses for transparent parts). In a lot of cases where parts are too pointy to work in ABS or polycarbonate without being extremely brittle, LEGO uses a softer and more rubbery material instead (e.g. Darth Maul's horns, Exo-Force hair, Yoda's ears, etc). 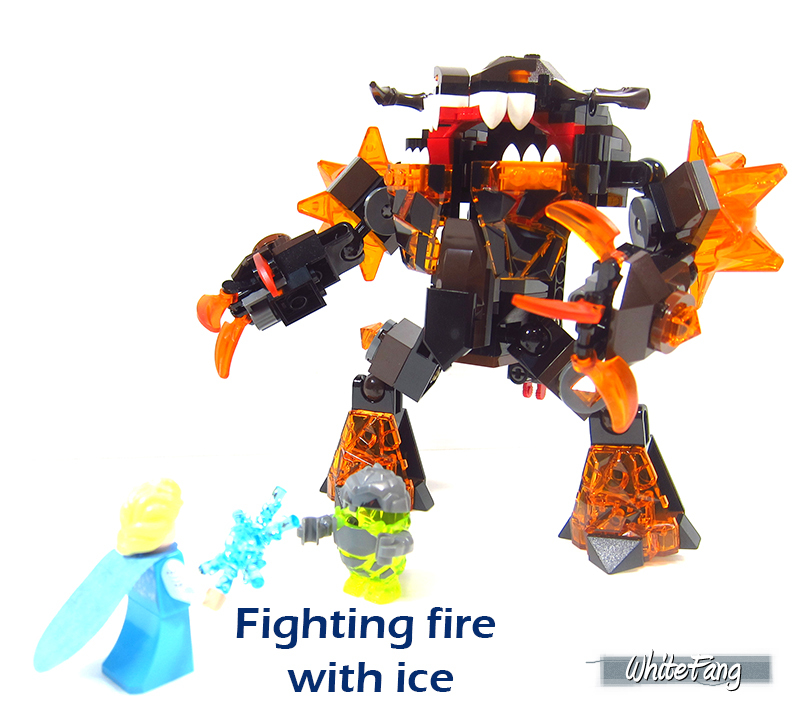 but that wouldn't work to create a fiery appearance, since LEGO doesn't have any synthetic rubber materials that would really have a glassy transparent look like this as opposed to a cloudy or frosted appearance. For reference, the evil brains from LEGO Hero Factory are a good example of what transparent plastics look like when molded in this sort of rubber material. But by making the flaming head piece a single 2K element, the shape of the head supports the shape of the transparent flames molded onto them, keeping the thin edge where the flames meet the head from snapping off. You step on a piece like this, and your foot will probably hurt but the piece might not be damaged. Whereas if the flame were a separate piece in the same shape, it might be prone to similar sorts of breakage to the old thin strap Classic Space helmets, the peasant hoods from Classic Castle, or the original design of Qui-Gon Jinn's hair piece from the 1999 LEGO Star Wars sets. Now, could LEGO have just designed the mold in a different shape entirely so that the flames don't curve inwards towards the head at the bottom? Sure! But then it'd look less like flames bursting out of the head, and more like the head wearing a flame-shaped helmet — almost like if you added a fiery texture to the top of this piece but left the thick bottom edge unchanged. Excellent review ...I love Elsa and Jack Skellington! Great and extremely thorough review as always, WhiteFang! It's very interesting to see so many torsos back to being without the neck mark again. I loved that the LEGO Movie 2 series had moved to being mostly European-quality plastic, as opposed to the slightly duller Chinese plastic used in all series previously. I wonder if this series is more of a mix between the two. Just like with the first Disney series, despite feeling fondly toward many of these properties I'm just not very interested in the minifigures. 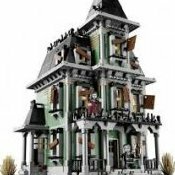 I'll probably pick up Jack Skellington and Hercules because all of their parts look fun and useful, and maybe Elsa and Sally for the great hairpieces especially. Otherwise, I can give the rest a miss. Thank you so much everyone for your thoughts and comments. It's great to know that most of you enjoyed this upcoming new series and for some of us, there are some minifigures which still interest you. I am really glad this review also had served an useful purpose to a large number of members too. Nope. Scrooge McDuck's top hat cannot fit on Mickey and Minnie's head. This photos will give you a rough idea. Yes, they are different. Thank you! Let's keep our fingers crossed. Well said. I do agree this is a very positive way of viewing these almost duplicates. Unfortunately, my Friends collection is very limited. Hope this photo could be of use. Liking this series, it is very good! Thanks for your wonderful review Fangy! They are always top-notch. I know I will need one of each of these figures at least, and those different head accessories on the figures will be great to add to the Friend's rubber hair. However this also brought a few flaws to my attention I didn't notice before. First of all the printing on Scrooge is a little bit off compared to the cgi (or something like that) pictures. His eyes are a little too small and should've reached his beak. Also his feat should have been orange with red printing instead of the other way around. Still these things were kinda to be expected. However what I don't like is that Jafar's cape is not black at the back, despite what is shown on the back of the promotional poster. It limits its usability, kinda were planning on using it on thor. And it bothers me how the flames are glued onto Hades' head, although I guess otherwise it might break when feeling the bags. Did the leaked one already had the flames attached or not? I can't remember. Nope﻿. Scroo﻿ge McDuck's top hat cannot fit on Mickey and Minnie's head. Thank you so very much for that!!! The thing is about the Collectable Minifigure theme as a whole, is that it's best suited for subject matters, franchises, archetypes, and characters that would otherwise not be viable within a playtheme and/or set. On the other hand, with something like Ninjago (outside of the cinematic movie), any potential entries to such a Series could easily be slotted into a set within the actual theme instead, as Lego has total creative freedom to accommodate any Ninjago character or creation into such. I did not like this series originally, but after reading the Brickset review and now this one, it's grown on me. I don't think it's as good as Series 1, but some of the designs are really cool. Scrooge, Herc and Hades are my standouts. I would like to see what they would do with a Series 3.